Confession… I'm one of those sadly obsessive types who always has a digital camera on his hip. Partly this is a professional 'tool of the trade'; partly it's to capture that fleeting moment that will never be repeated and can never be re-created (what Henri Cartier-Bresson famously described as le moment décisif). Also, as is often the case for those who work in a moving medium, still photography has a particular appeal - no worries about erratic pans, dodgy zooms or bloody dogs and aircraft making noises off. The frozen image is pure. Do I use Photoshop? Of course - within limits and without apology*. Photos have always been manipulated in one way or another. More things went on in the dark room than you could throw a tripod at. The moment you crop a photo, you are manipulating the image and the camera lens itself distorts. You could even argue that the very decision where to place the camera is a form of manipulation. Below are a selection of the striking, the evocative and the downright quirky, taken since the year 2000 in various parts of the globe where I've lived, worked or holidayed. Deliberately, they are in no particular or logical order. I've also added notes explaining, when relevant, the circumstances which prompted the photo. 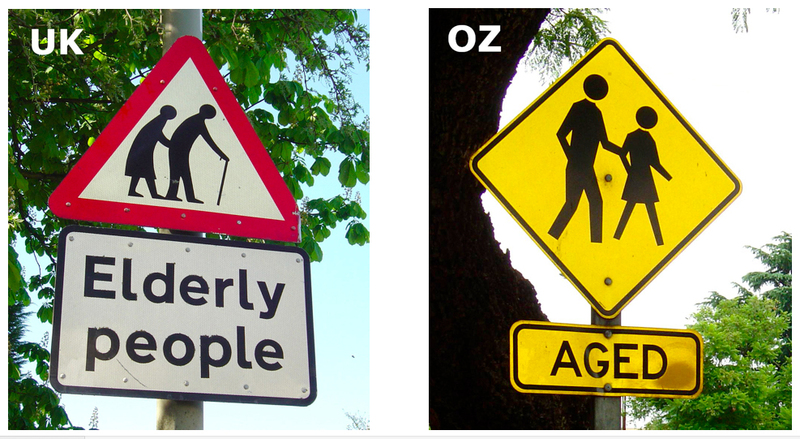 Purists may say that a photo should be its own statement - 'a picture is worth a thousand words', etc.. Perhaps - but a few words can often add some useful context. 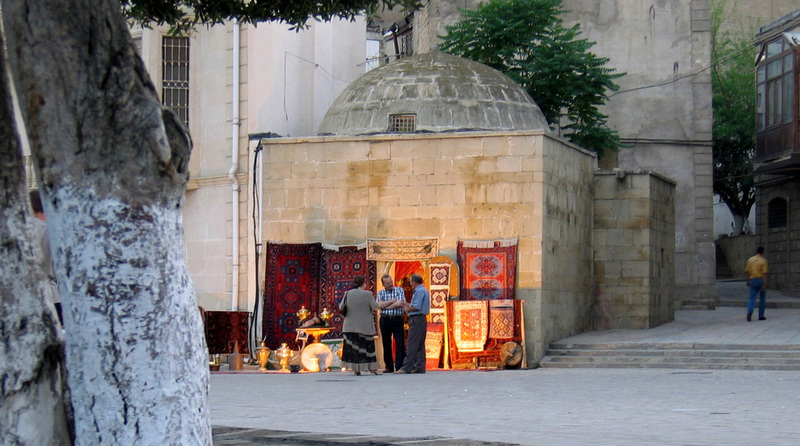 There are more photos, incidentally, on my 'Monpazier' web-page. As for the equipment… Kyocera, Canon, Nikon, Sony and Panasonic are all represented here. 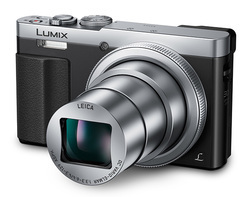 (Current camera: a Panasonic Lumix TZ-70 with a Leica 30:1 zoom). And always a compact camera no bigger than a pack of cards, never an SLR. I refuse to carry a brick around my neck. Kindly note that all the photos are copyright: © Michael Delahaye. Should you wish to use any, please get in touch via the 'Contact' web-page. * Truth to tell, I have lately switched from Photoshop to Affinity Photo, which I would recommend to anyone in the same line of business. There is something disturbing about this scene… surreal. We seem to be beside the sea - and yet there are dead, skeletal trees where you'd expect rocks... and grass where you'd normally find sand. You half-expect to see Dali's molten watches draped from the branches. 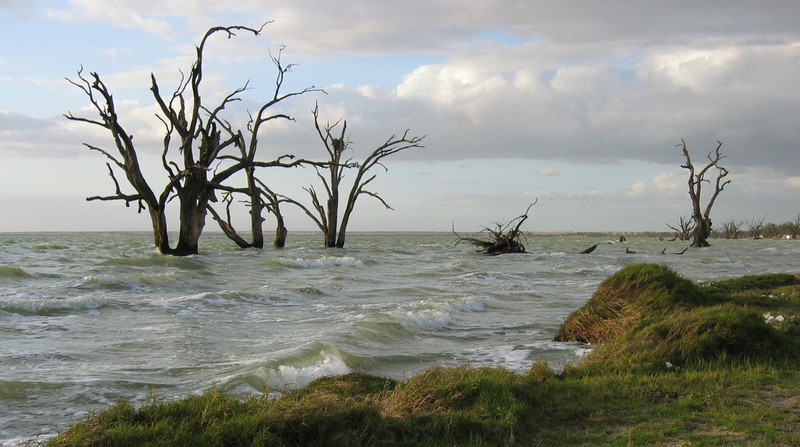 In fact, the location is a lake - Lake Bonney in South Australia - and a storm is about to break, which explains the white-capped waves. This is what I'd call a 'narrative photo' - the modern equivalent of a Victorian painting. 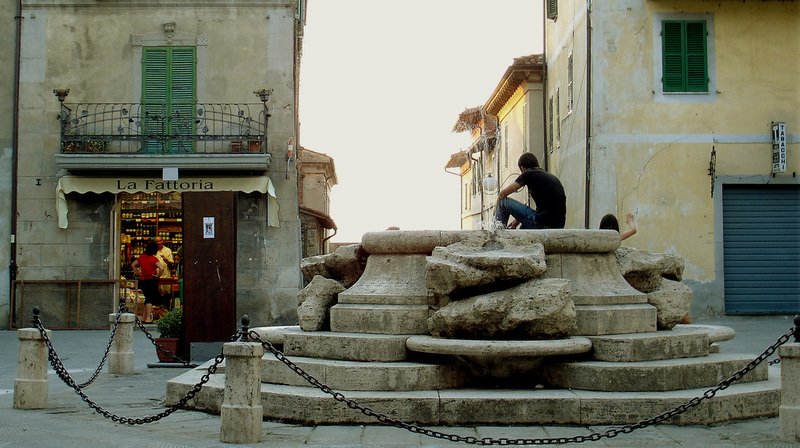 It was taken early one summer evening in the town of Castiglione-del-Lago on the edge of Lake Trasimeno, Umbria. There's the sense here of an evolving story… with characters living their lives within and beyond the immediate moment of the photo. There's the woman, arms akimbo, chatting to the shop-owner - while the young Lothario on the fountain waits for we-don't-know-whom and the child next to him waves to a friend we can't see. The fact that all these characters are turned away from us adds to the mystery - but, equally, to the possibility of multiple interpretations. 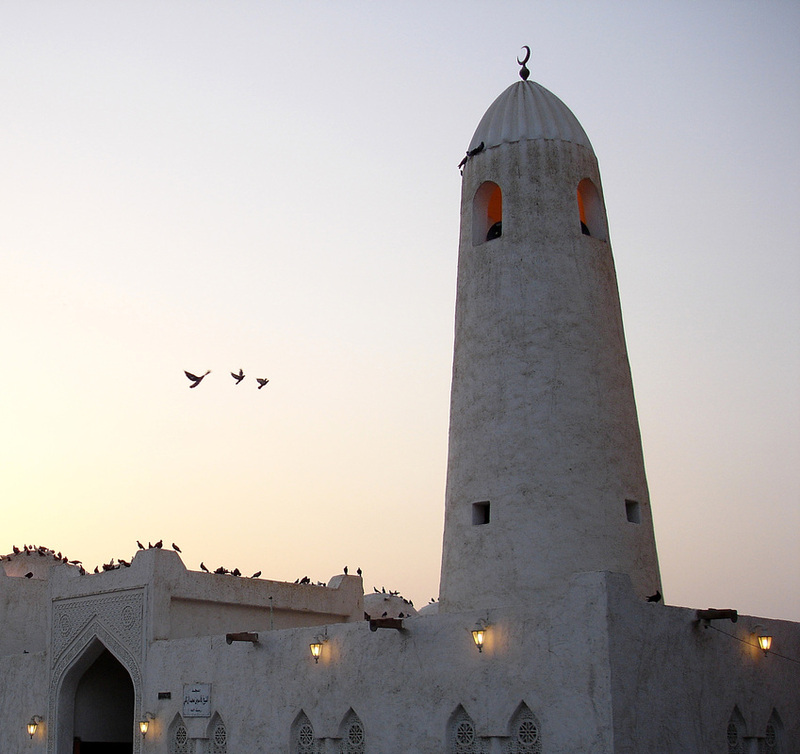 A mosque in Doha, the capital of Qatar - shot during what photographers (both still and video) call 'the magic hour'. In truth, it's generally less than an hour - the twenty minutes before and the twenty minutes after sunset. The building has an obvious oriental charm but it's the three birds wheeling in the sky that catch the eye. Echoes of those plaster ducks-in-flight which, like vertical roadkill, used to adorn the walls of suburban living-rooms in the UK during the 1950s - now much sought after by collectors. 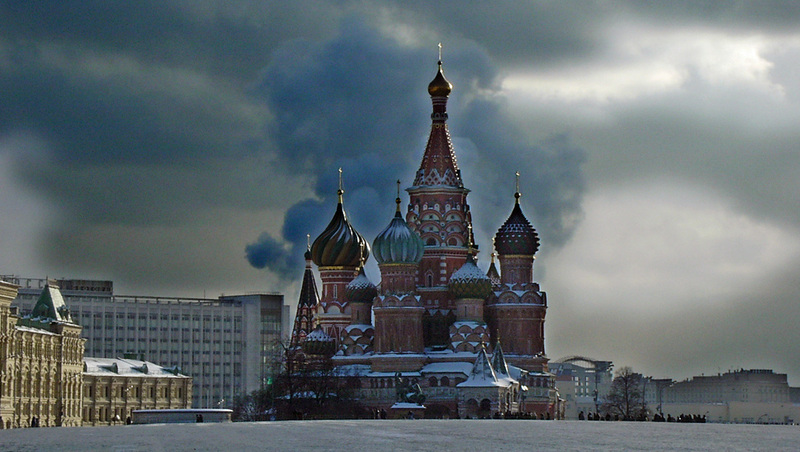 St Basil's Cathedral, Red Square, Moscow… I first visited Russia in 1998 - as a media consultant funded by the British and American governments to help promote independent television journalism. Several 'tours of duty' across the country followed. For anyone of my generation who had grown up during the Cold War under the constant threat of nuclear annihilation by the Soviet Union, it was a chilling yet exhilarating experience to stand in Red Square, the scene of so many menacing military parades. This photo seeks to capture something of that menace. It was taken one freezing February afternoon, the dramatic backdrop being provided by a power station on the horizon exhaling vapour into the sub-zero atmosphere. 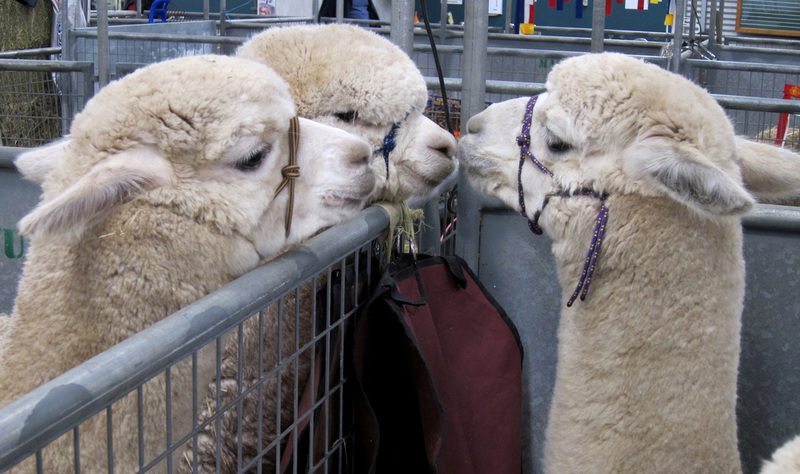 Royal Adelaide Show, 2010: sociable animals, alpacas… There's nothing they like more than a chinwag about wool prices, unless it's comparing hairdressers. 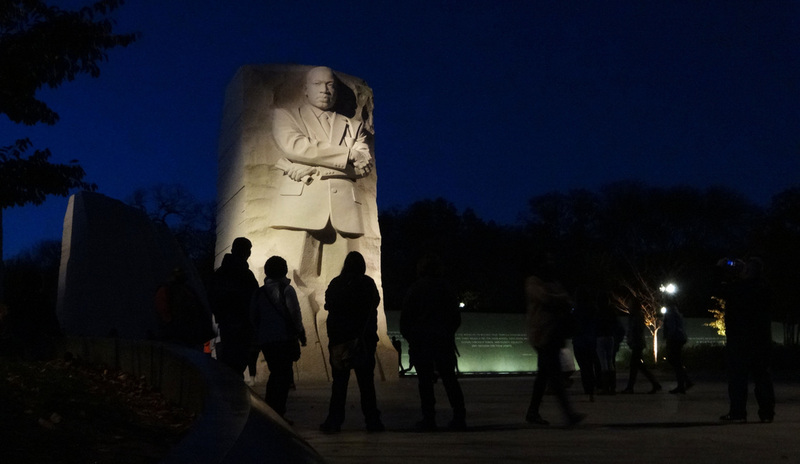 The Martin Luther King Memorial, Washington DC, winter 2014. I arrived just as night was falling, so the dramatic effect of the nine-metre-high figure emerging from the rock was heightened. Unusually, it's a monument that succeeds in capturing the spirit of the man - which is interesting because the sculptor, Lei Yixin, is Chinese and the monument itself was carved from Chinese granite. Proof that common humanity can transcend narrow nationality - even if some of King's admirers object that an iconic black African American has been represented in white Chinese stone…. 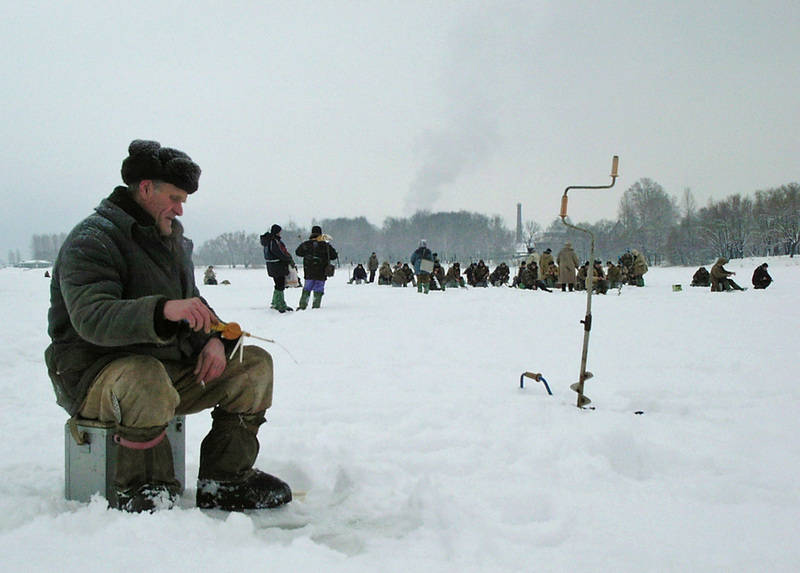 Yekaterinburg, Russia… the temperature is in minus-double-digits and these locals are drinking chilled beer. 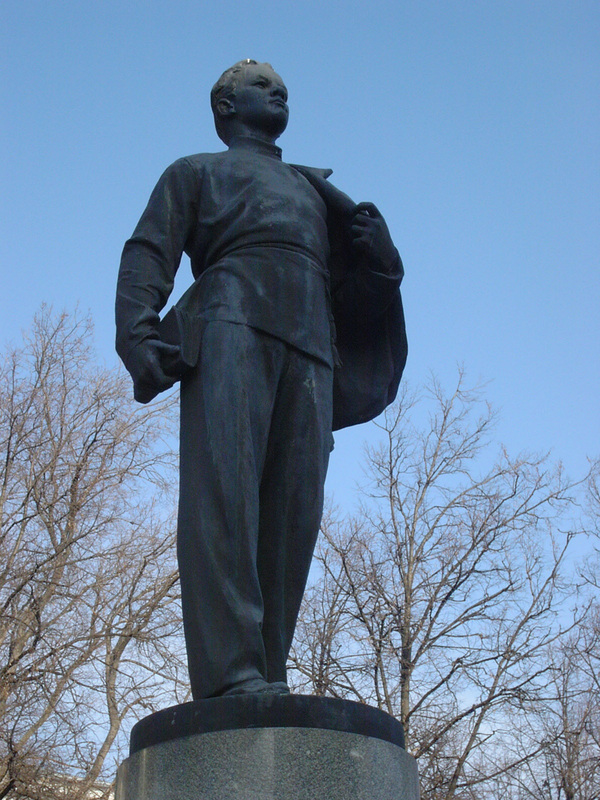 They explained that the reason for perching rather than sitting on the bench was that it would be too cold with their feet on the ground… Any wonder that both Napoleon and Hitler failed to conquer Russia? Skopje, capital of the Former Yugoslav Republic of Macedonia, 2004… On a day off from working with Macedonian State Television, I came across a group of children on a school outing. Like kids everywhere, they were all too willing to pose for a photo, particularly for a foreigner. 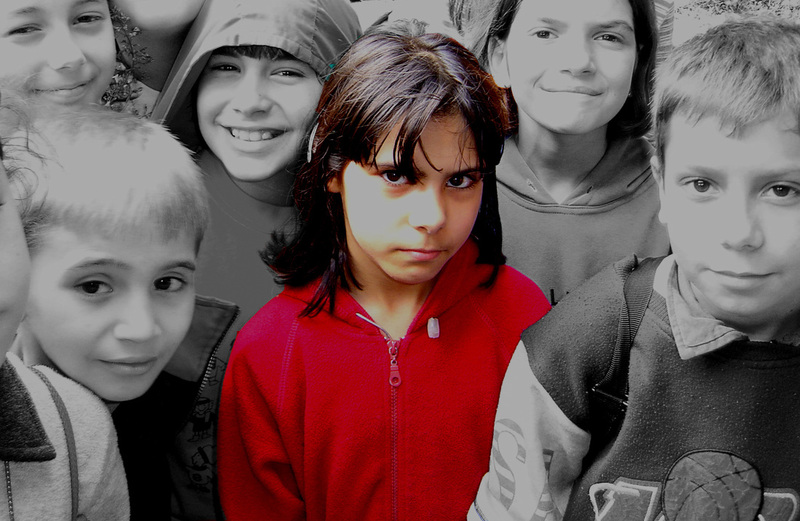 It was only when I looked at the photo on my laptop that I noticed the eerily penetrating expression of the girl in red. Photoshopped? Up to a point. 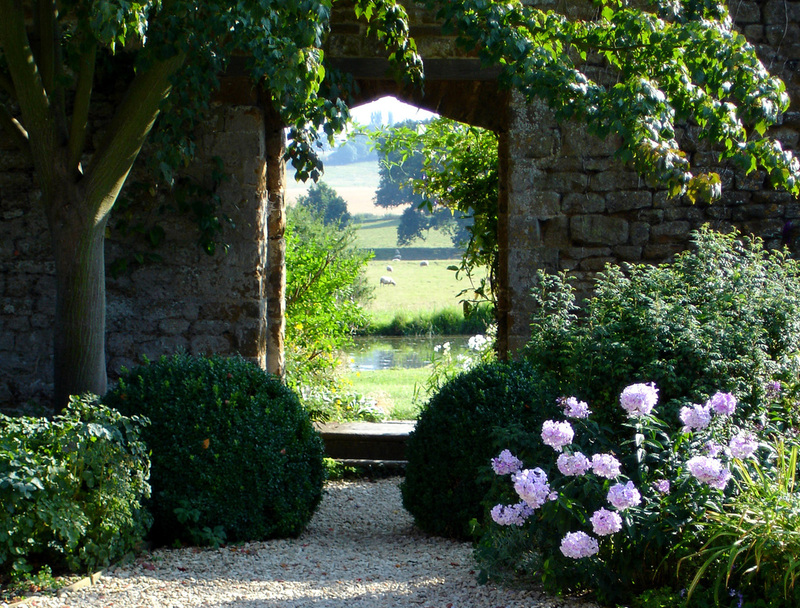 The walled garden at Broughton Castle, Oxfordshire… Through the ancient archway, across the moat, sheep graze in pastures green. England at its bucolic best. 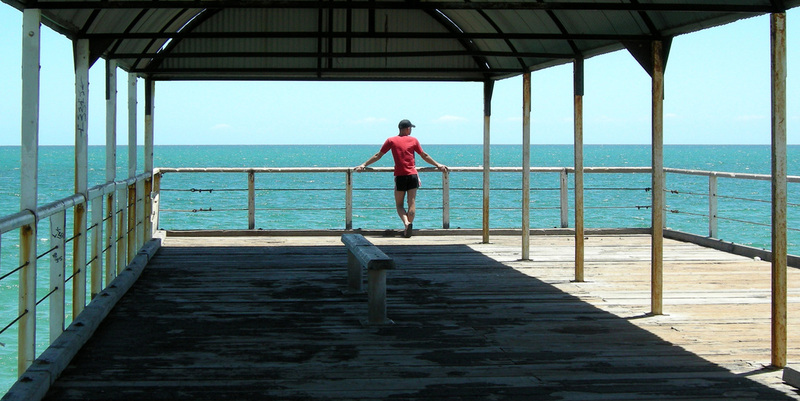 Sometimes luck is with you… This is the jetty (or 'pier' as we English say) at Henley Beach, South Australia. I was taking the photo for a TV training module - to demonstrate to camera-operators how important it was to lead the viewer's eye into the picture by means of strong, structured perspective. Just as I had lined up the shot, a stranger came from behind… walked into frame and, without being asked, took up the perfect pose in the perfect position. Better still, he was wearing a red T-shirt. 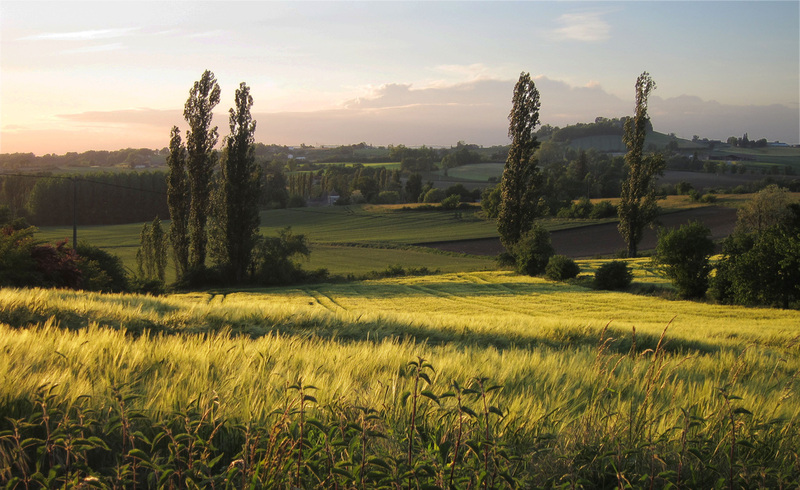 Evening shadows lengthen across the landscape of the Lot-et-Garonne, France. Just beyond the horizon is the hilltop bastide of Monflanquin. 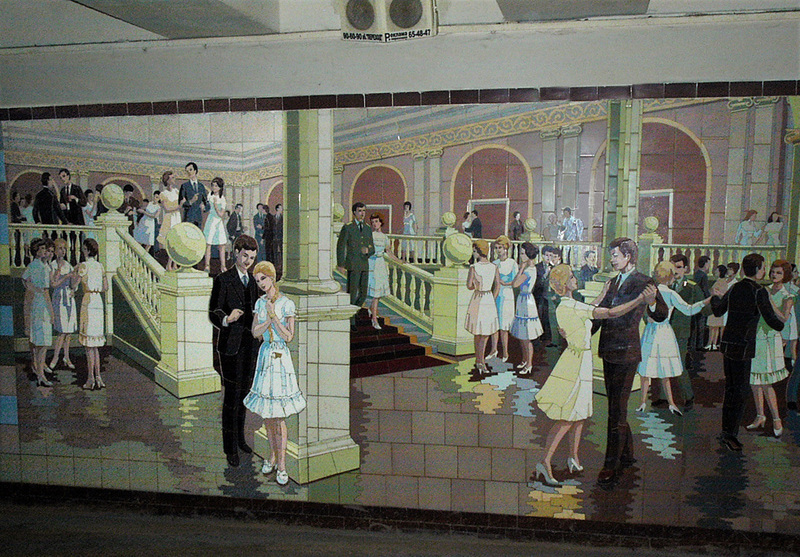 A Soviet-era tiled mural in a pedestrian underpass, Rostov-on-Don, Russia. Hard to know how idealised a picture this is of young people's social life in Brezhnev's Russia (I'm guessing the 1970s) but it's acutely observed, with the young lovers in the foreground, the girls-only huddles mid-ground and even the lone wallflower in the mid-background. Mind you, if that dance floor is as highly polished as the reflections suggest, it could be lethal. 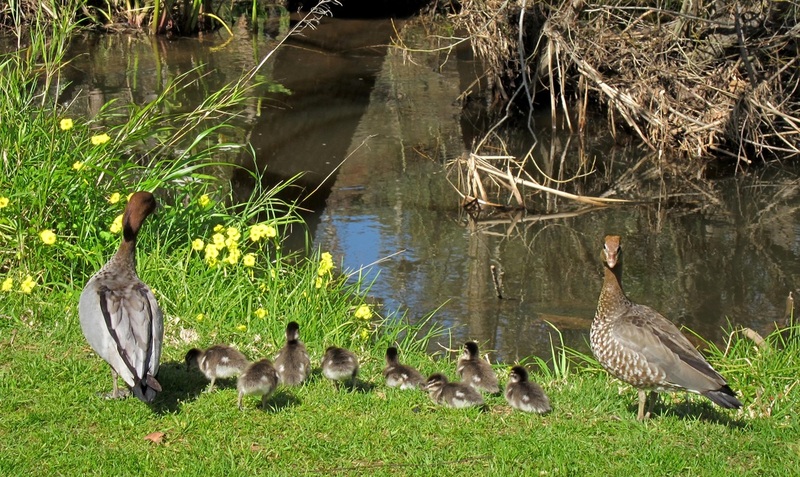 As a rule, I don't do cute… but it's not often you get all your ducks in a row like this. It's Brownhill Creek, Adelaide, a kilometre from where we used to live and where I would go for my Sunday morning cycle ride. Another reason for always carrying a camera - even on a bike. Meet Herr Hitler… Not an invitation that most of us would relish, but this is the sight that confronts you as you turn a corner in the Documentation Center in Nuremberg. 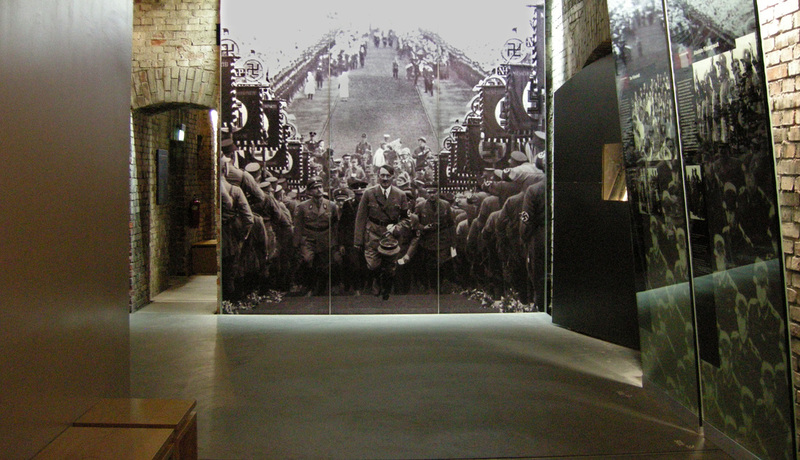 The Center, housed in Hitler's vast unfinished Congress Hall near the site of the Nuremberg Rallies, seeks to explain - without excusing - the rise of the Nazis and the consequences for Germany and the world. A visit requires a couple of hours and, I was told, is obligatory for all those who join the German armed forces. 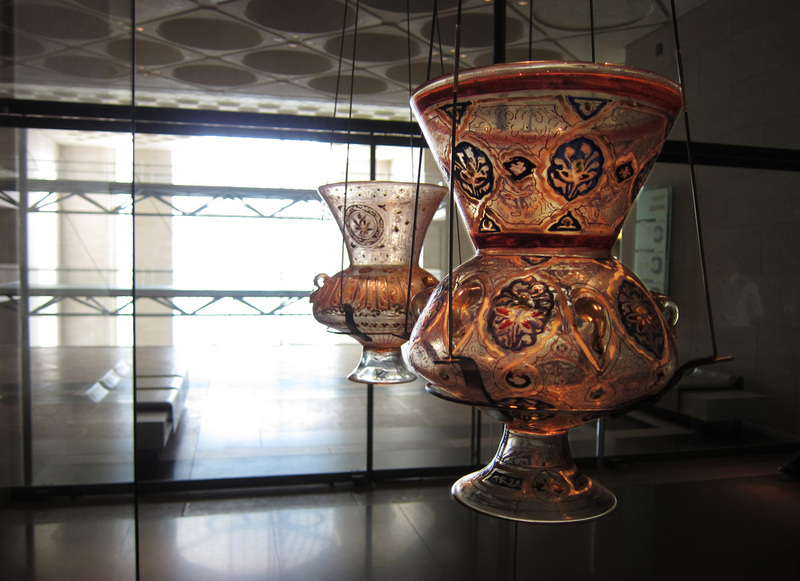 A pair of mosque lights in The Museum of Islamic Art, Doha, Qatar. Tuscany: a 'casa colonica' on the road between Castelfranco-di-Sopra and Arezzo. 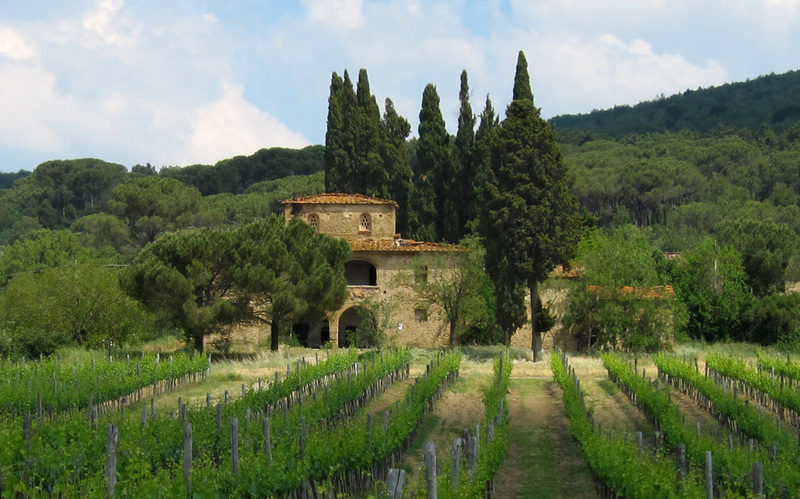 Since this is the less fashionable eastern side of Tuscany, it's a real working farmhouse, not a holiday let. At least, not yet. 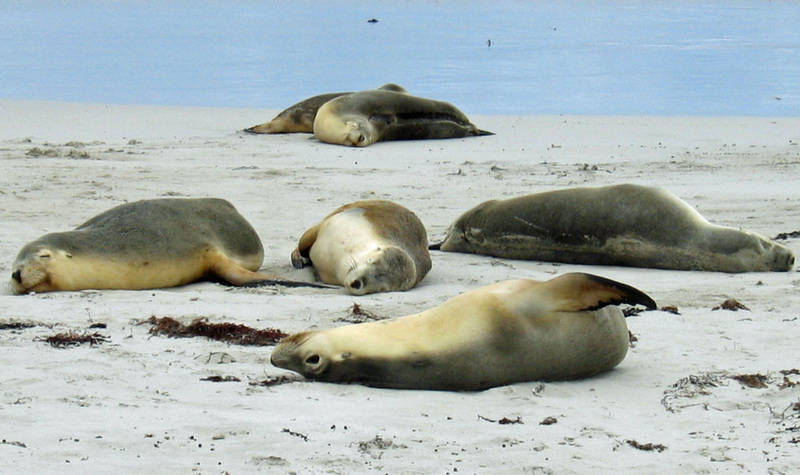 I don't know whether there's such a sport as 'formation dozing' but these seals on Kangaroo Island, off the coast of South Australia, seem to have mastered it to Olympic standard. 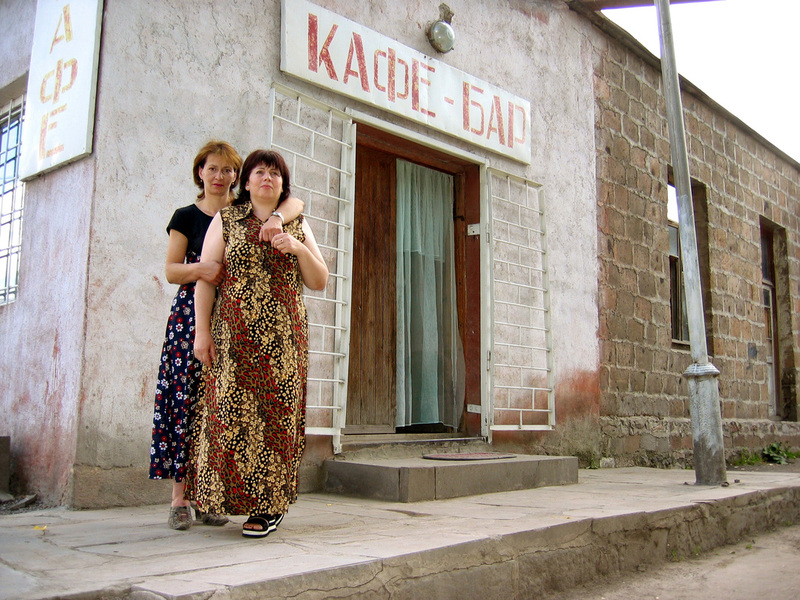 2003: Irina and Irma are sisters living in Javakheti, a desperately poor Russian-speaking pocket of Georgia that is 95% populated by Armenians. (The post-Soviet Caucasus can be a bewilderingly complicated place…) To make ends meet in the new enterprise-driven capitalist economy, they run this Café-Bar. These are formidably resilient women - 'splendid' in every way. They are also funny and warm and, as the photo shows, devoted to each other in their daily struggle for survival. Without being asked to strike a pose, they wrapped themselves together - as though presenting a united sisterhood against an indifferent world. A reminder of just how easy and privileged a life we have 'in the West'. 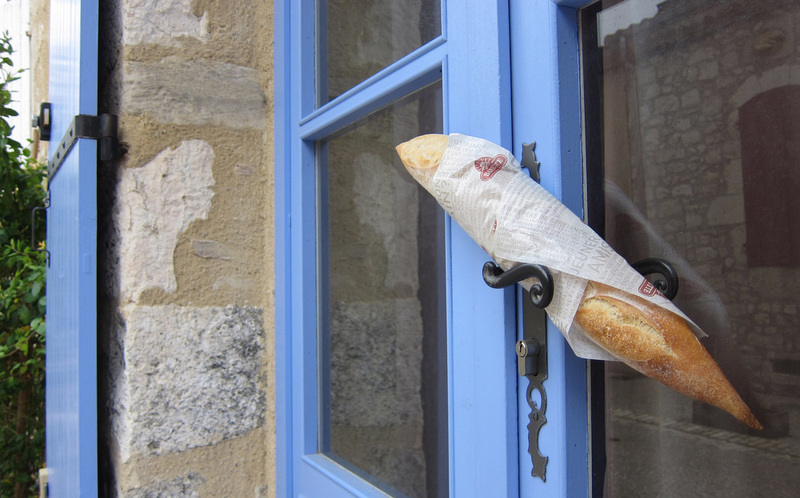 Monflanquin, the Lot-et-Garonne, France… See, there's a reason for those ornate door-handles. Beauty often appears where and when you least expect it. 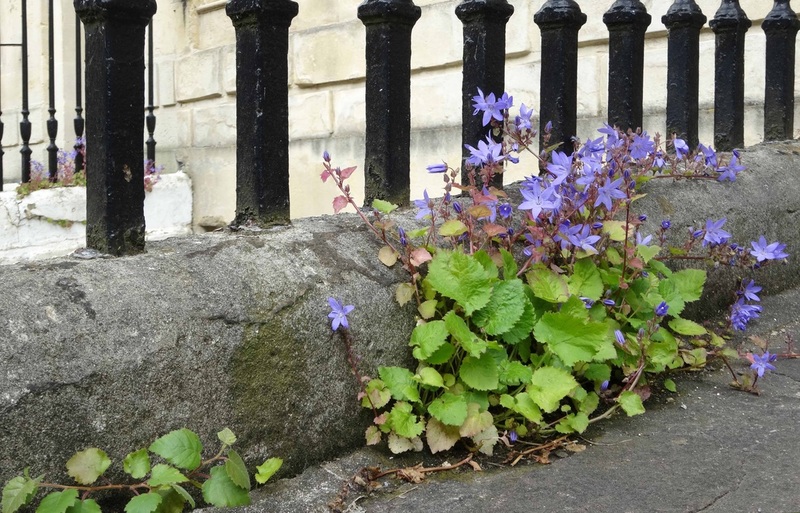 Walking through the centre of Georgian Bath, I came across this self-seeded example of Nature reasserting herself at pavement level. Nothing a quick shot of Weedol won't fix - but not yet. 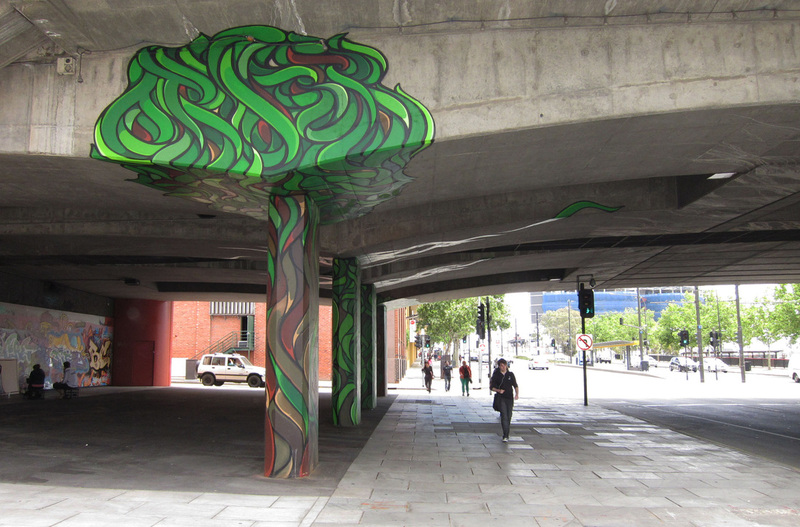 There's an entire photo-essay to be done here: 'Urban Growth - Life in the Cracks'. 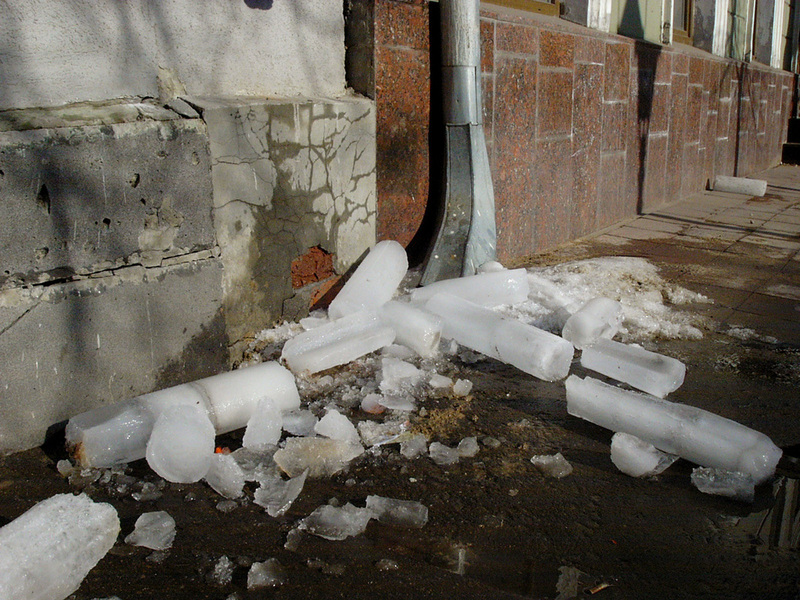 Kazan, the capital of Tatarstan, Russia… If you think winter is bad, wait till spring when the pavements are strewn with these lethal 'ice-skittles' from thawing downpipes. Each is over a foot long and the noise as they descend is like a machine-gun rattle. Frame within a frame… The view from the 'pug and pine' hut regularly used by South Australian artist Hans Heysen in the 1920s when painting in the Flinders Ranges. 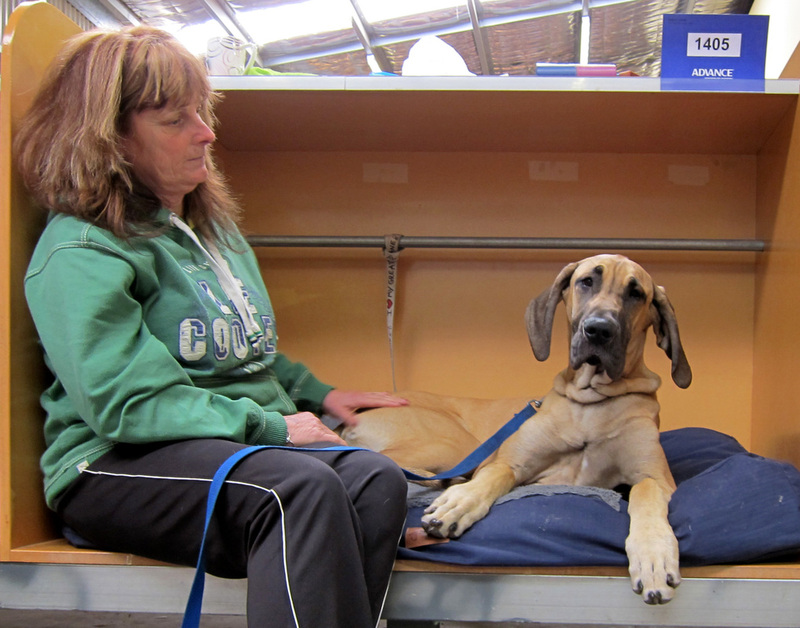 It's made of pine slats, mud (the 'pug') and chicken-wire - and is to be found in the Aroona Valley. 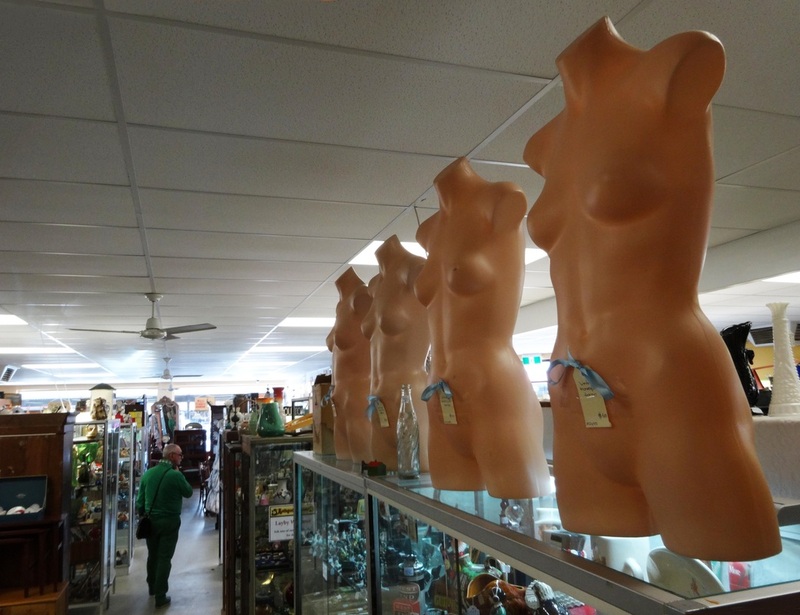 Antique shop, Strathalbyn, South Australia. How do they decide where to put the price tags - and what's with the blue bows? But one shouldn't mock. The Greeks after all had their caryatids and they too generally came in rows of four. Sometimes you end up breaking your own rules. 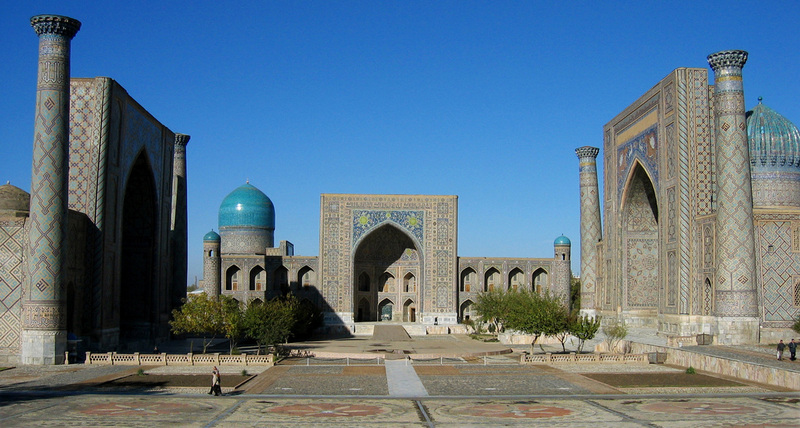 This is the Registan at Samarkand, Uzbekistan. I'm always telling camera-operators not to shoot buildings straight on but to 'find the angle'. But the only way to convey the majestic immensity of this area was a straight-on panoramic shot. Even the tiny figures in the foreground and off to the extreme right of frame are so dwarfed as to be lost. 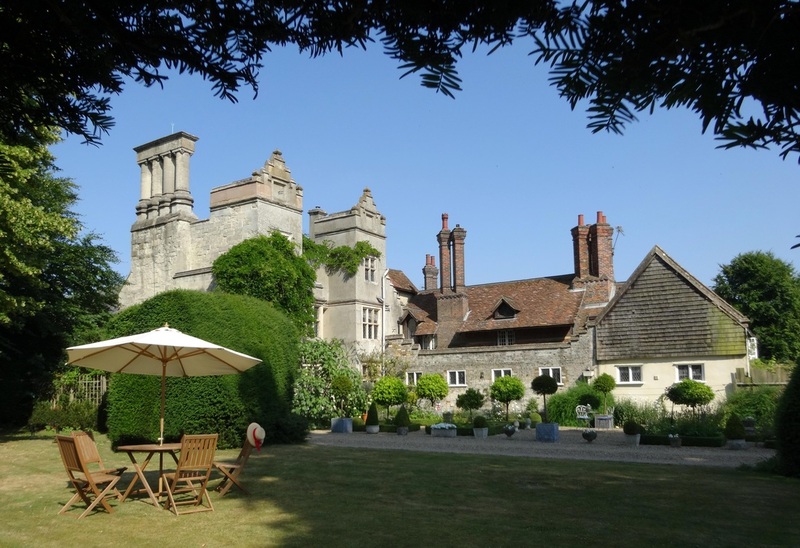 The Manor House, Little Gaddesden, UK. Built in 1576 during the reign of Elizabeth Ist. Just add Pimms. 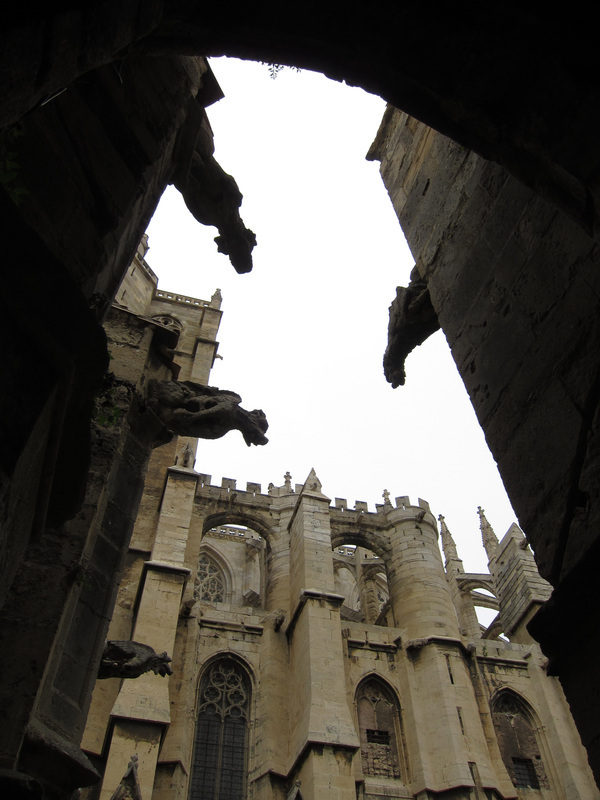 Gargoyles on Narbonne Cathedral, France - a reminder that these grotesque adornments also had a purely practical function: to project water off the roof as far as possible from the wall. 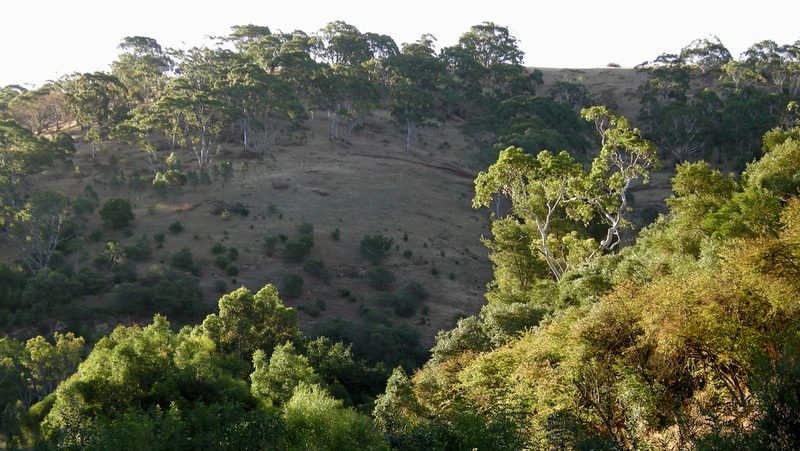 Brownhill Creek, Adelaide, in January, which in Australia is high summer. Note the intense light and the distinctive colours. This is what so perplexed the early European artists (mostly English and German) who tried to paint the Australian landscape. Their palettes - their choice and range of paints, particularly the greens and earth colours - were European. 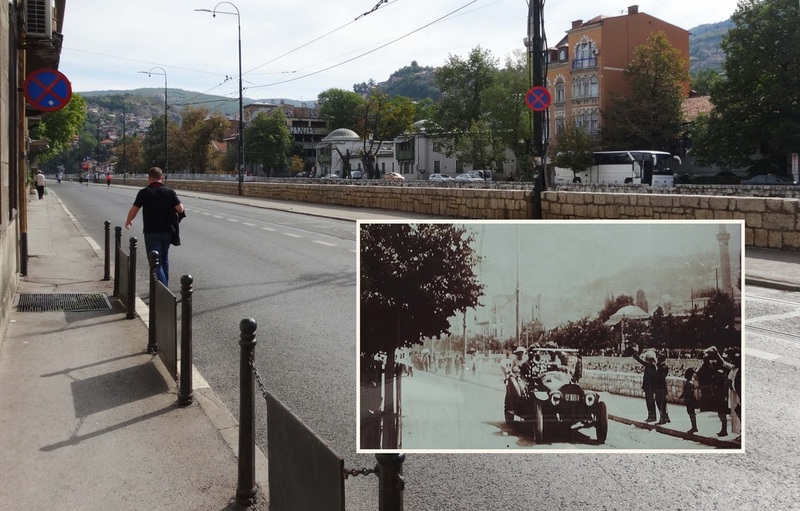 This made it difficult, if not impossible, for them to replicate what they saw around them; more difficult still to capture the 'spirit of place'. Those who succeeded had to see with new eyes… and paint with new palettes. 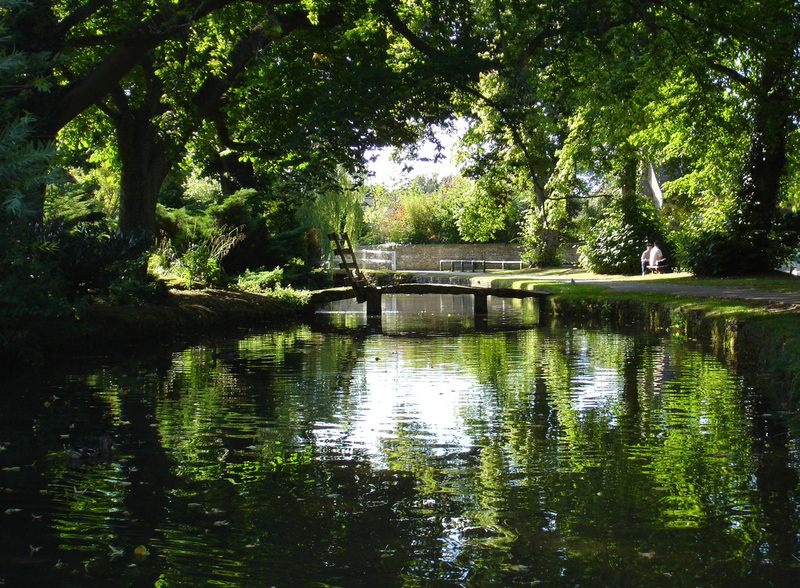 Happy to be a hermit… There are places you come across, places that seem to have created a perfect, self-contained domestic world of their own. 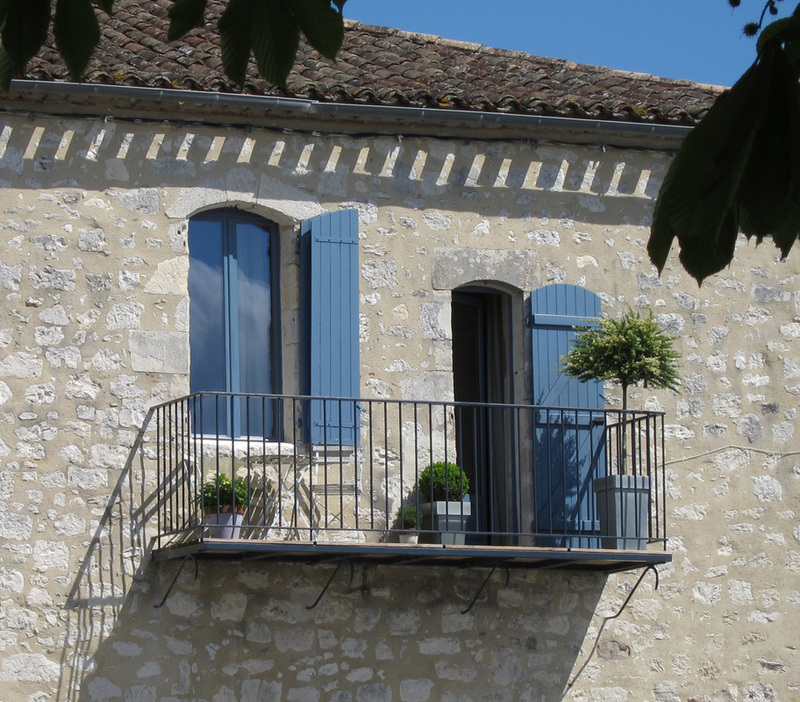 This gem of a balconied apartment on the top floor of a medieval building overlooks a leafy square in the hilltop bastide of Monflanquin, France. The slanting shadows of the roof tiles, the blue of the shutters against the grey of the stones, picked up by the same blue of the sky… How could one not be happy in such a place? 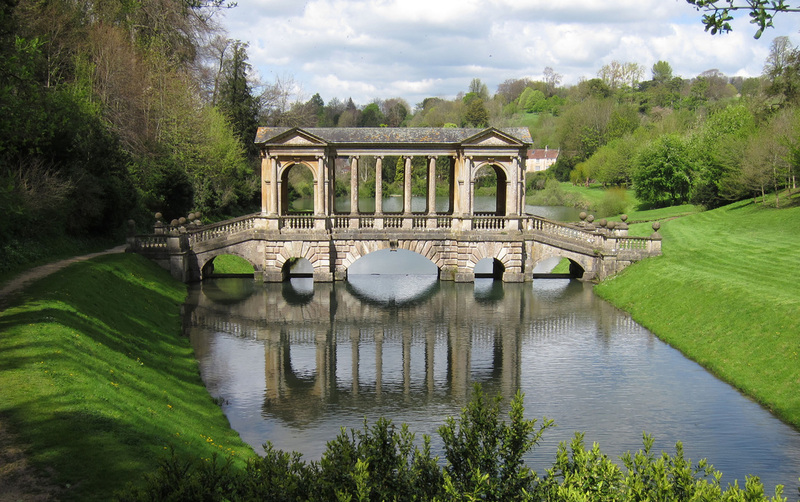 The Palladian Bridge at Prior Park, overlooking the Georgian city of Bath, UK. I readily admit to being mildly obsessed with these bridges. 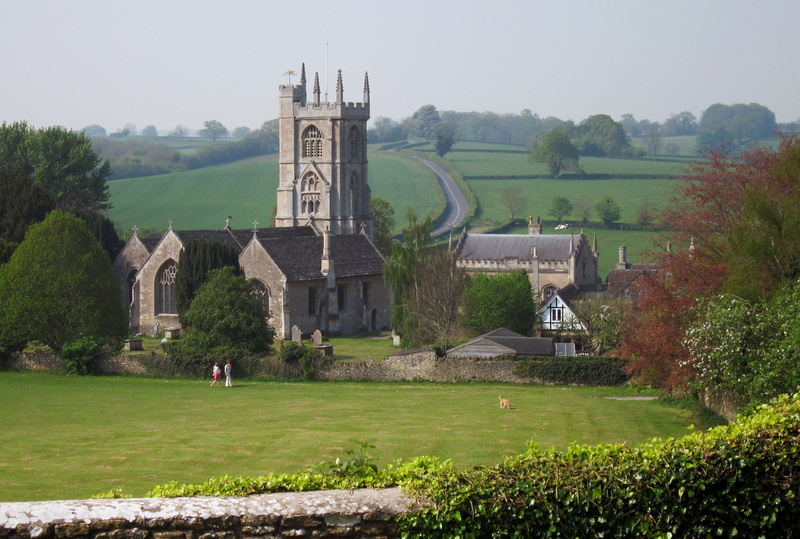 There are no fewer than four of them, all built during the mid-eighteenth century. Three are in the grounds of English country houses - Wilton (1736), Stowe (c.1742), Prior Park (1756) - and one, unlikely though it may seem, in Russia. Catherine the Great was so impressed by the Wilton original that she had a copy built (1770-76) at Tsarskoye Selo, her residence near St Petersburg… not in stone of course, but imperial marble. Andrea Palladio himself, incidentally, never built such a bridge; he was merely the inspiration. The closest he came was the three-span competition entry he submitted for a bridge over the Grand Canal in Venice. He lost - the chosen design was the single-span Rialto Bridge we see today. 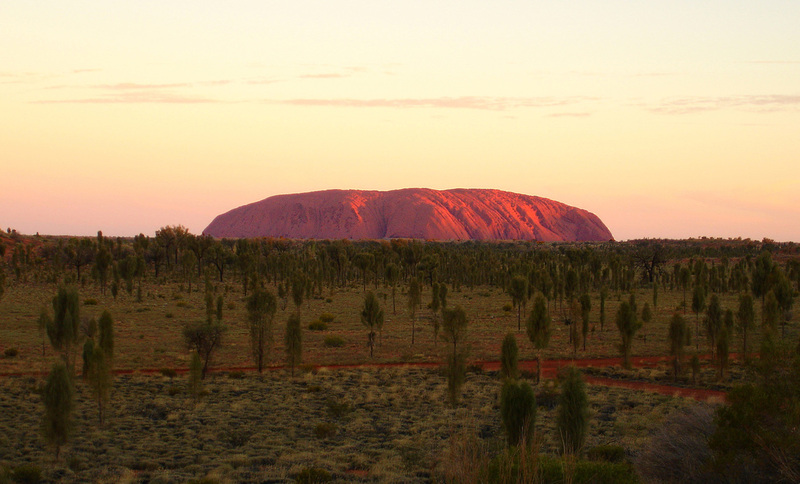 Uluru (aka Ayre's Rock), central Australia, at dusk. I don't know of anybody who, having seen it, hasn't been moved. A truly magical place. 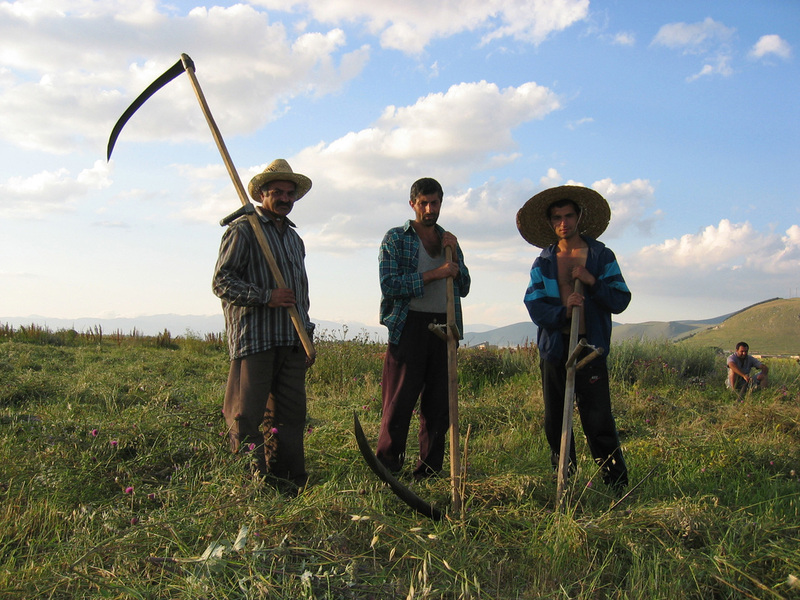 While working in the former Soviet republic of Georgia, far from the capital Tbilisi, I came across these workers in a field and asked if I could take their photo. No posing was needed. As though by instinct, they took up their positions in what could easily pass for a Soviet propaganda tableau. Sometimes an image just hits you between the eyes. 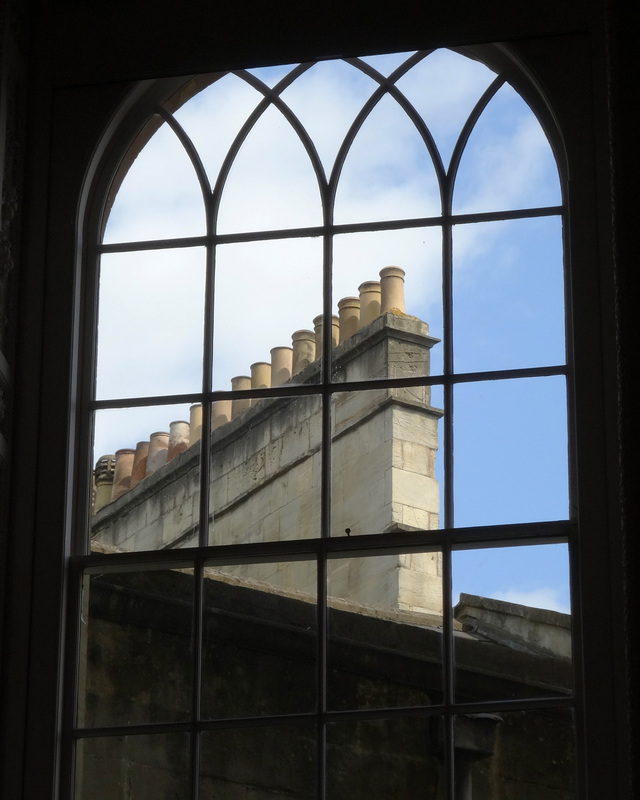 This was one such case - as I was walking around the eighteenth century Assembly Rooms in Bath, UK. Apart from the dramatic 'geometry' of the shot, there's a question: why would a single house require no fewer than fifteen chimney pots? Answer: it's not a single house; the chimneys actually service the houses on each side of the stack - so at least two, and probably five storeys each, including basements and attics.. I collect the little wayside shrines which you find in Italy - photos of them at least. And not just the old ones. 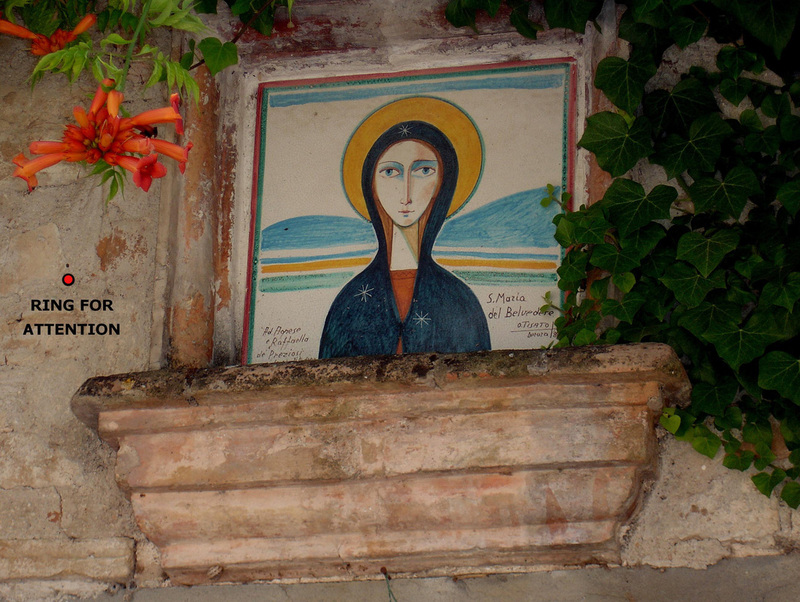 I came across this modern shrine in Cortona and realised that I had stumbled upon a new iconographic type: La Madonna del Reception. With apologies to those who find the Photoshopped addition in poor taste. The sun sets over the small port of Robe on the coast of South Australia. 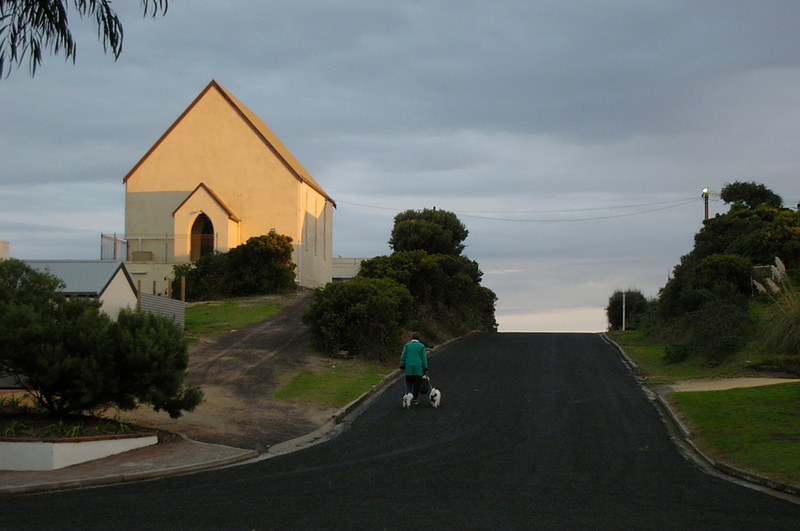 A woman walks her dogs past the church… 'and leaves the world to darkness and to me'. Antipodean shades of Gray's Elegy. 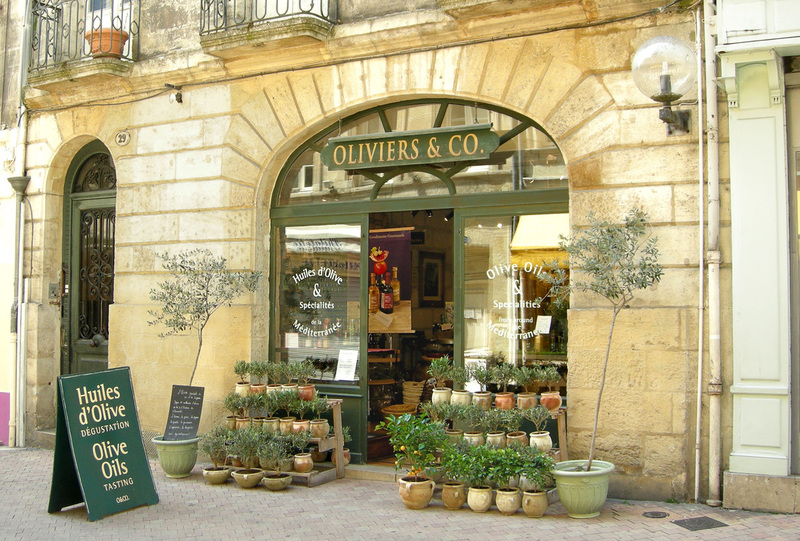 You have to hand it to the French... For decades they turn up their noses at Australian wine. 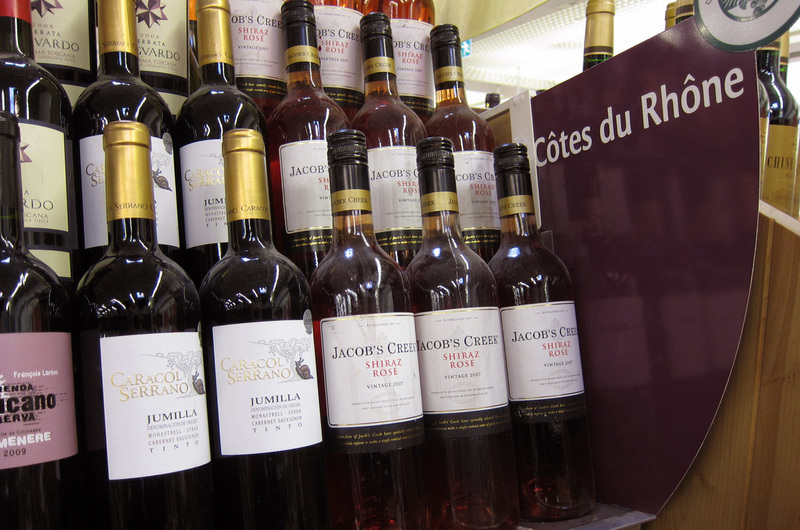 When finally they have to acknowledge its existence and even concede there may be a market for it in France, it appears on the shelves as an 'honorary' French wine (Carrefour, Narbonne, May 2012). A votre santé, Mate! There's something about this photo that manages to be both tasteful and tacky. It shows an ornament for sale ($40) in a garden centre in McLaren Vale just outside Adelaide. 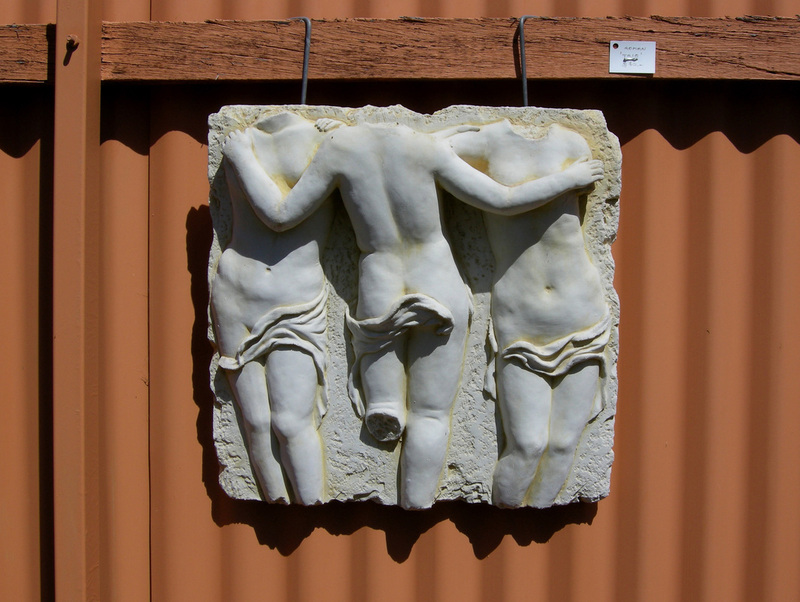 On one level it's a cheap slab of concrete hanging against a corrugated iron fence - and yet the headless copy of the copy of the copy of The Three Graces has lost none of the original's harmony and vitality. 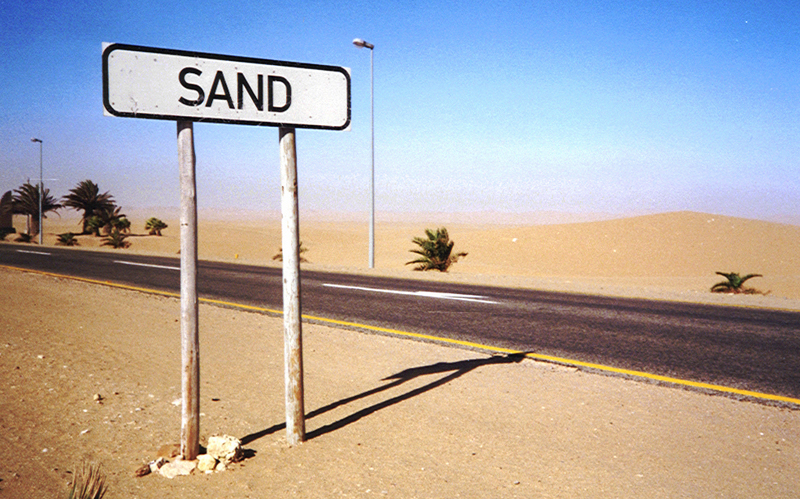 Forget what and where it is; viewed purely as an image, it's beautiful. Just a pity about the modesty cloths - which I don't recall being on the original. A picture doesn't always tell the whole story. 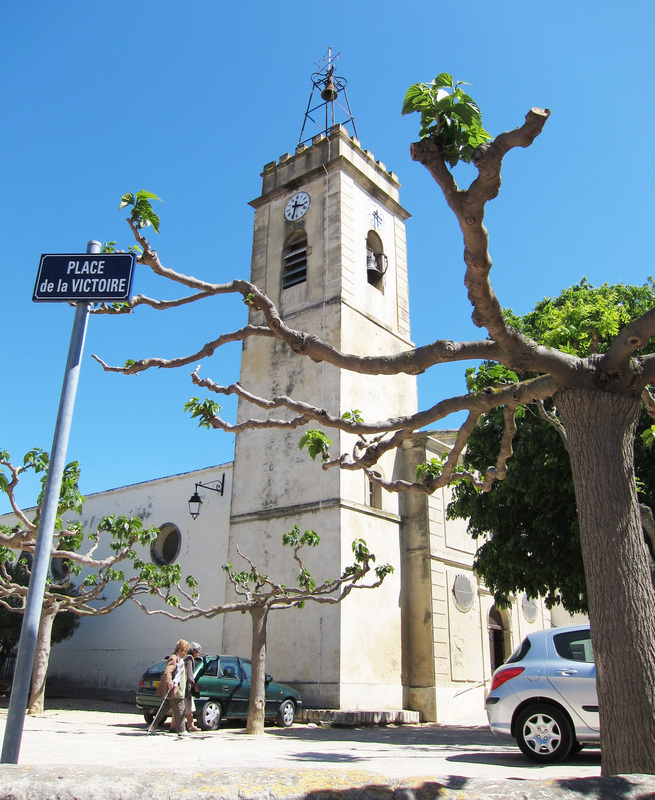 This photo was taken on a bright May day in the fishing village of Bouzigues on the south coast of France. 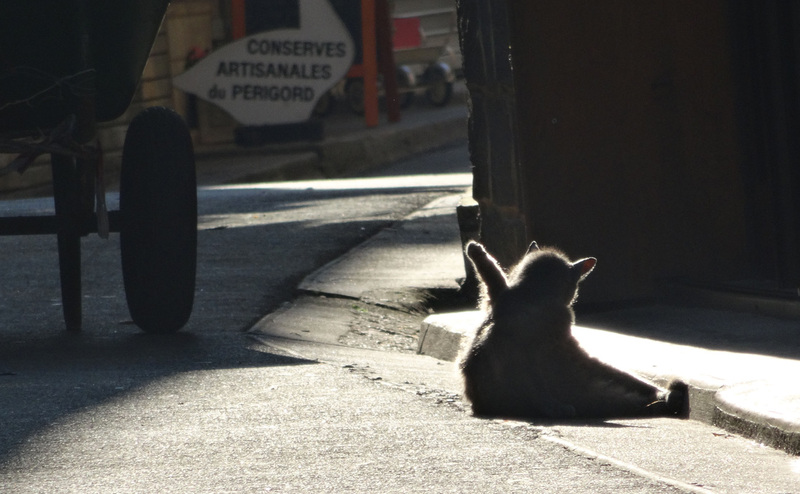 As I strolled in the sunshine, all seemed well with the world. True, there was hardly anyone around but presumably they were all at work, possibly a few kilometres down the coast in the nearest big town, Mèze. These two elderly women were the only people, apart from me, in the main square. After I'd taken the photo, I asked them what went on in the village by way of social activity and entertainment - what 'animations', as the French say. One of them smiled and replied, 'Que les deuils'. Only funerals. 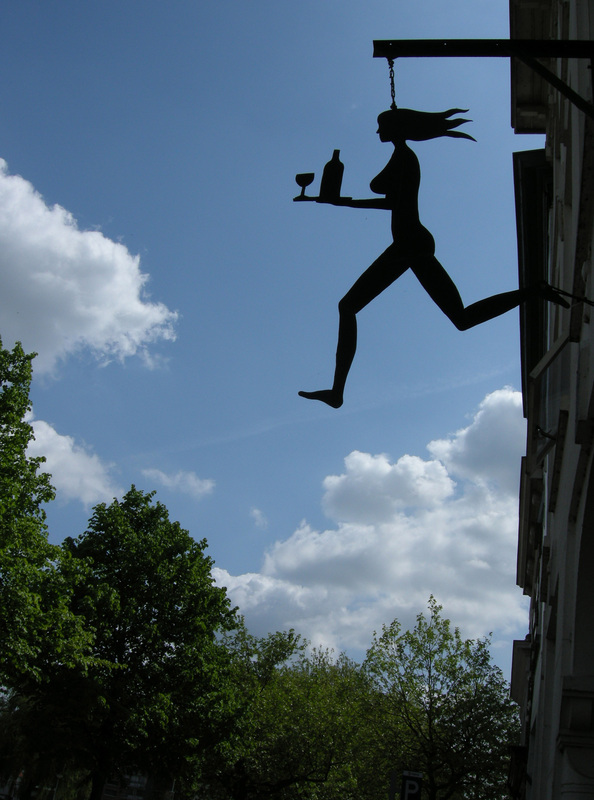 The Dutch know a thing or two about 'express' service - as this pub sign in Groningen shows. 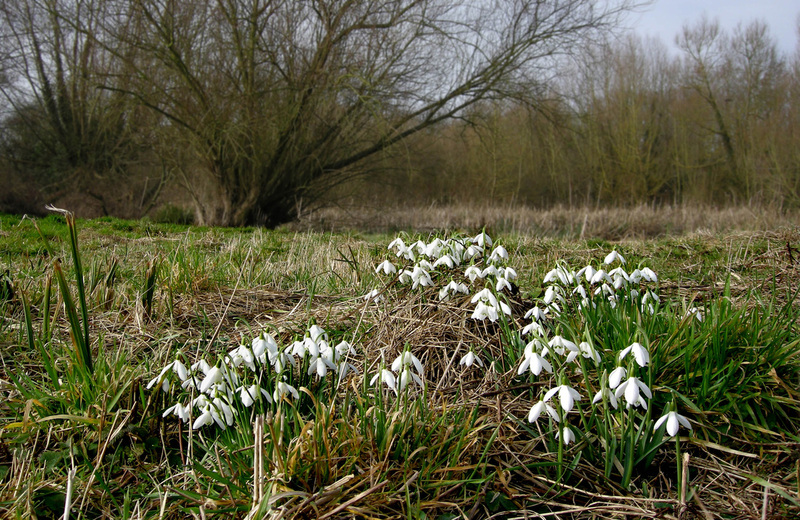 Wolvercote Common, Oxfordshire: the first snowdrops… unplanted, unplanned, as Nature intended. 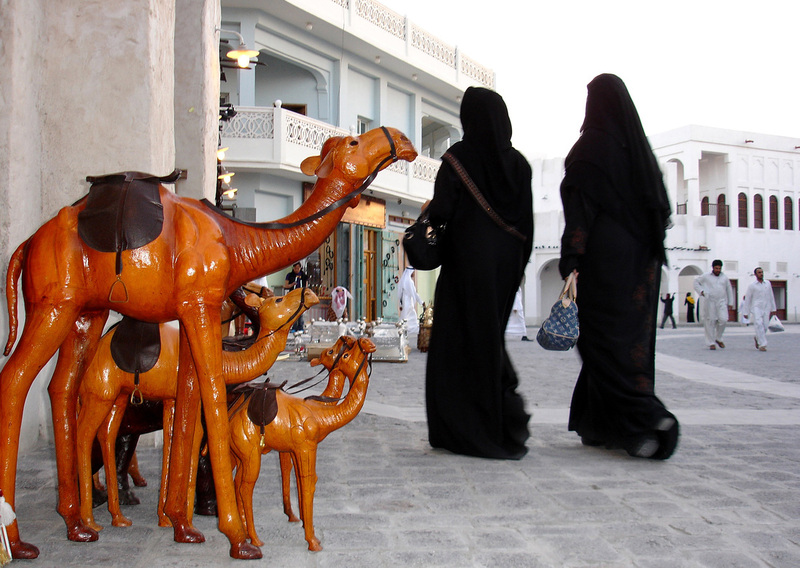 The Suq Waqif, Doha, Qatar. 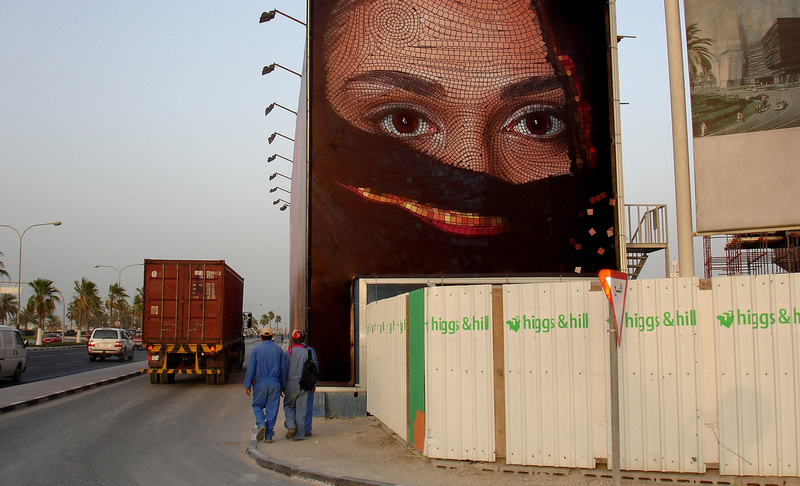 Whether stills or video, taking pictures of women in a muslim country is a delicate matter - but not impossible. 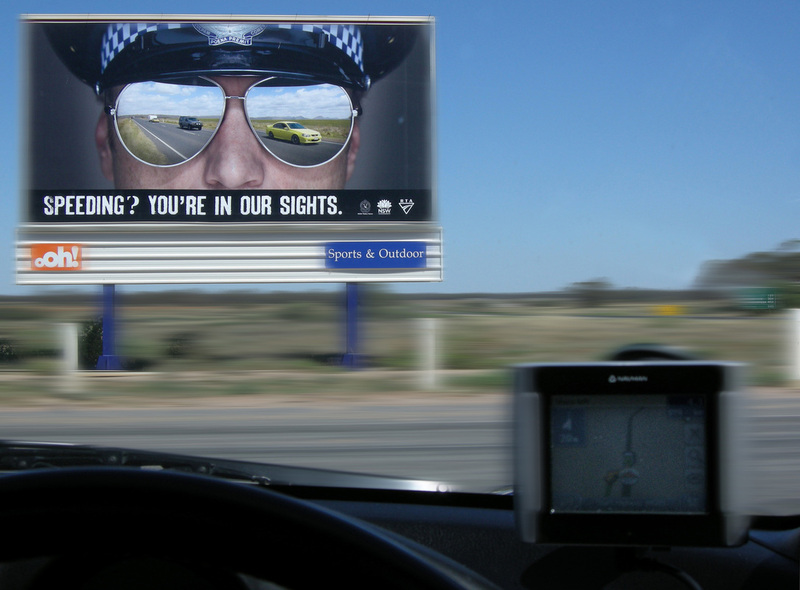 While driving alone cross-country from Adelaide to Canberra, I came across this NSW police hoarding. I was so taken by it that I threw a U-turn, steadied my camera on the steering wheel and, risking a dangerous driving charge, made a second high-speed pass. Supermarket shelves must be a rich source of material for sociologists. 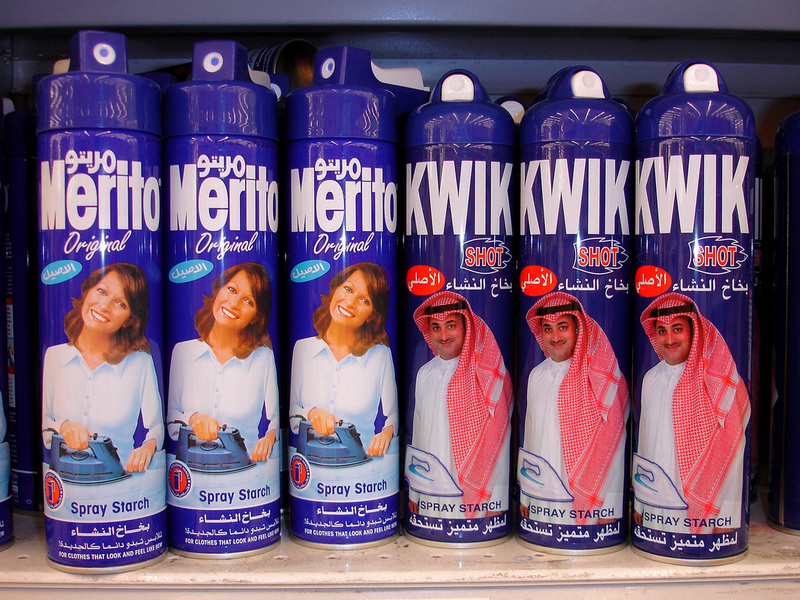 This was taken in Carrefour in the City Center Mall, Doha, the capital of Qatar. She's deliriously happy doing the ironing… and he is clearly well satisfied with the results. The shelf-stacker who arranged them side by side like this must have had a fine sense of artistry - or irony. And no, there was no 'stage-management' on my part. I swear. 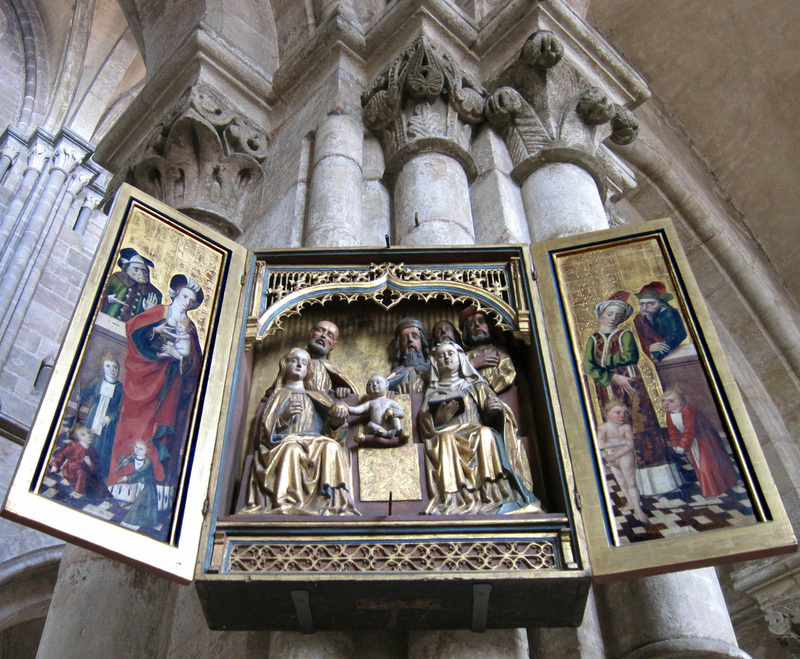 This 'boxed set' of the Holy Family is to be found in the church of St Sebald in Nuremberg, the German city that was 90% destroyed during the Second World War. Clearly intended to be mounted high, it radiates an extraordinary, redemptive power. Take a step into the unknown with the European Union! Never let it be said the bureaucrats of Brussels lack a sense of humour. 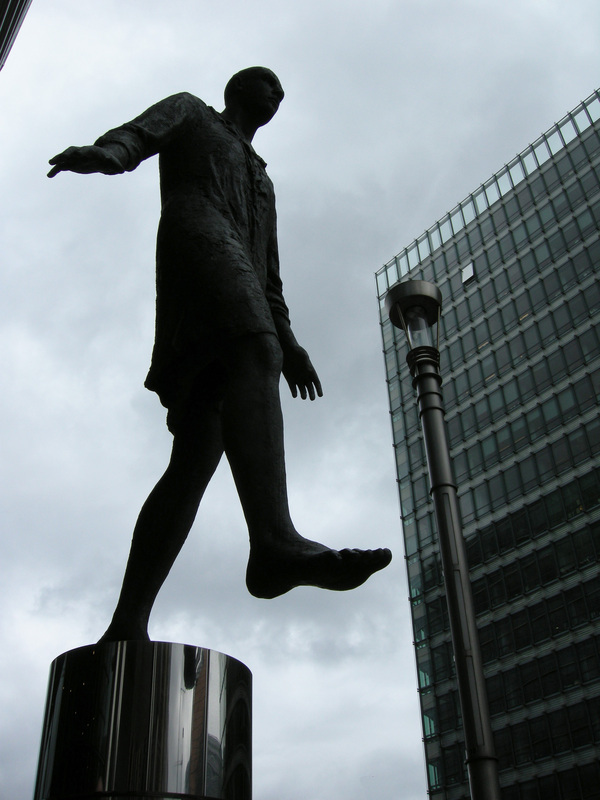 The statue is outside the EU Commission building. A pedimental hunk of ornate stonework atop a building in the centre of Baku, Azerbaijan - so high that most people probably never notice it. 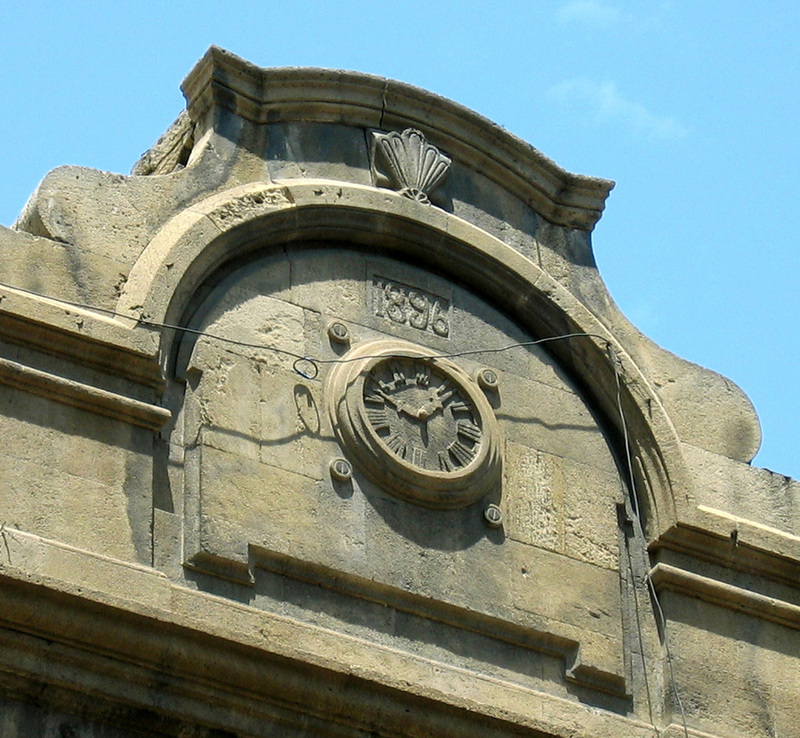 It's not uncommon for sculptors to carve the date of construction into buildings - but the very hour and minute? "Hey, Mubariz, what time do you make it?" Whatever your views on graffiti, there are the occasional examples which undeniably enhance the urban landscape rather than deface it. This is the far end of North Terrace, Adelaide - a splash of wit and colour amid an expanse of drab concrete. Hard not to smile. The Spidermen of Doha. The capital of Qatar is a forest of tower blocks - each vying to outdo its neighbours in height and design. 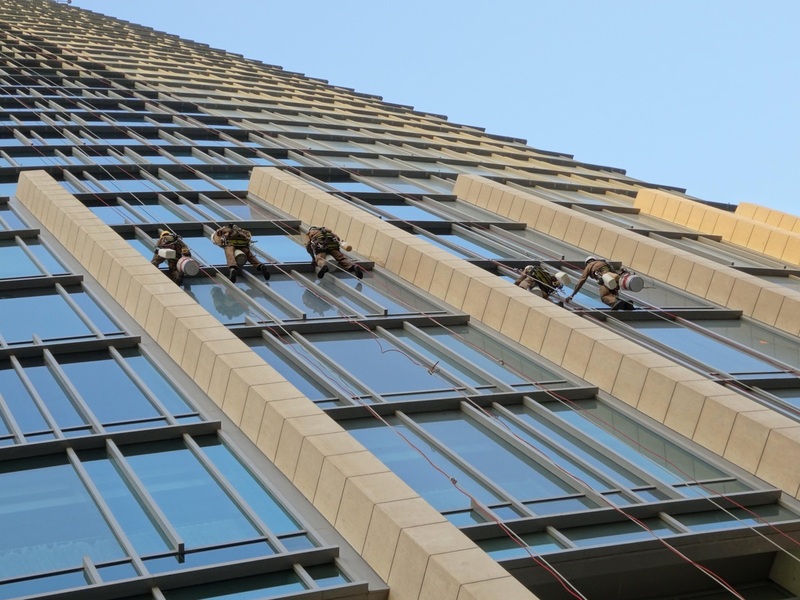 But someone has to clean the windows - a specialist job on account of the salt spray off the Arabian Gulf. Not for the faint-hearted. 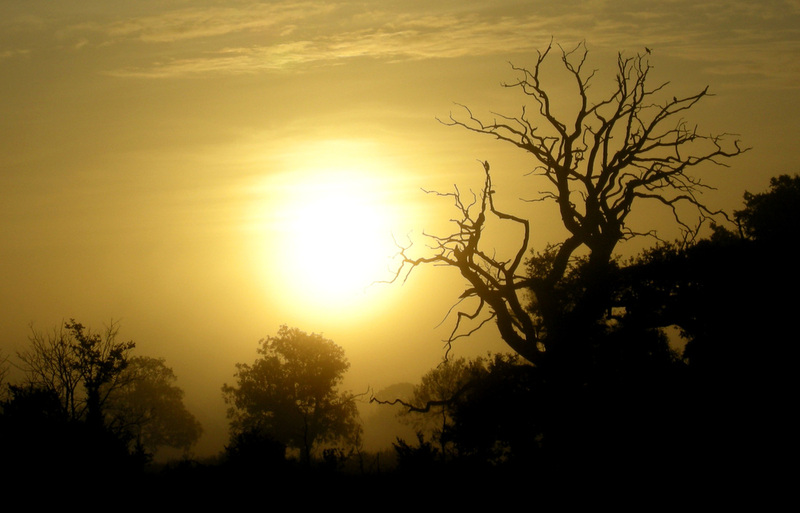 A new day dawns in Woodeaton, Oxfordshire, UK. Note the birds on the branches, watching and waiting. 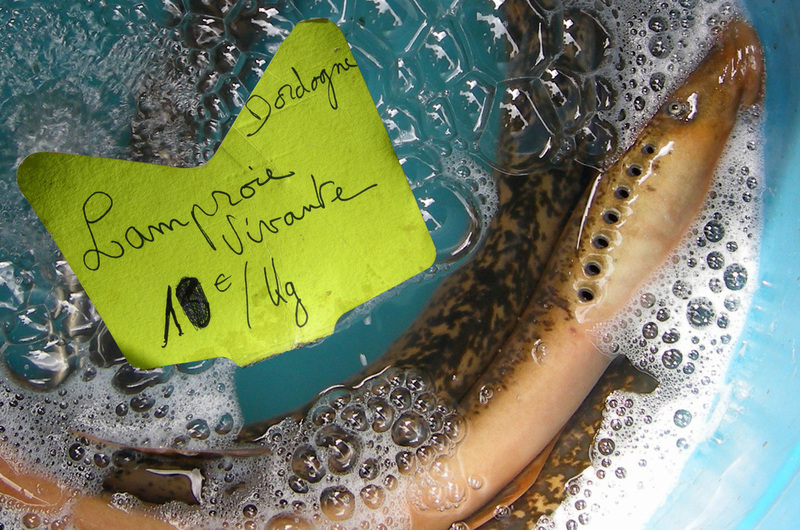 I was with my wife and some French friends strolling through a Sunday morning market in the suburbs of Bordeaux when we came across this lamprey on a fishmonger's stall My only knowledge of lamprey was that an English king had died of a 'surfeit' of them - but here was the real, living, gasping thing. Coiled up in a blue plastic bucket. There was something shocking about the creature's freakish beauty and its pitiable predicament. With hindsight, I should have paid the 10 Euro ransom and released it back into the River Dordogne. I've deliberately avoided items from the family photo album - but this is an exception. 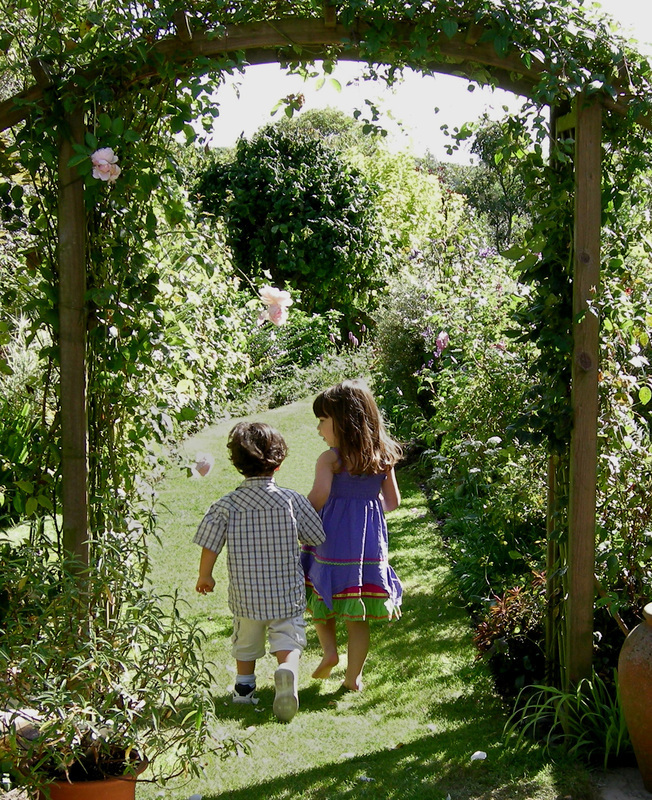 It's of my grand-children Matilda and Ben in an Oxfordshire garden. Anybody who remembers the old adverts for Startrite children's shoes will recognise the 'hommage'. 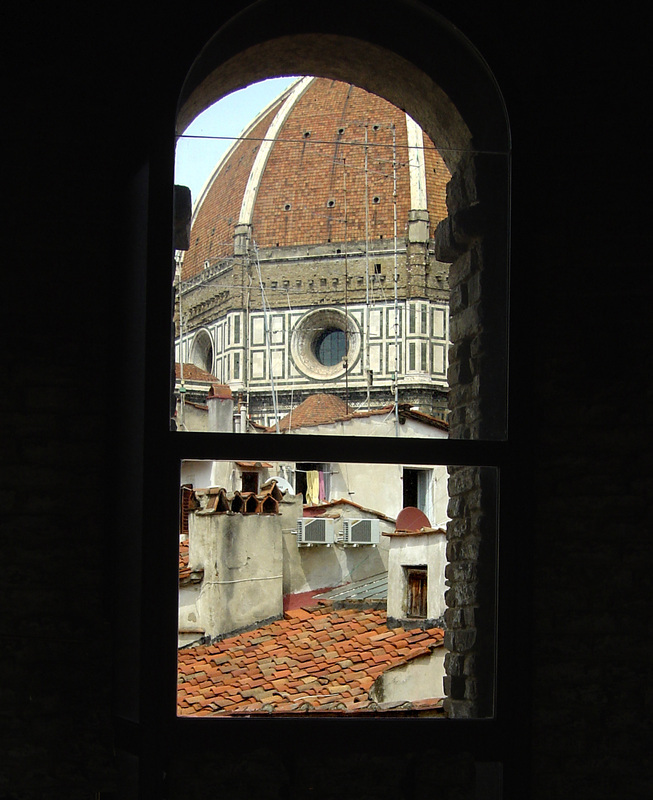 Few buildings can have been so often photographed from so many angles as the Duomo in Florence. Having lived and worked in the city in late '60s, I thought I'd got - or seen - the lot. 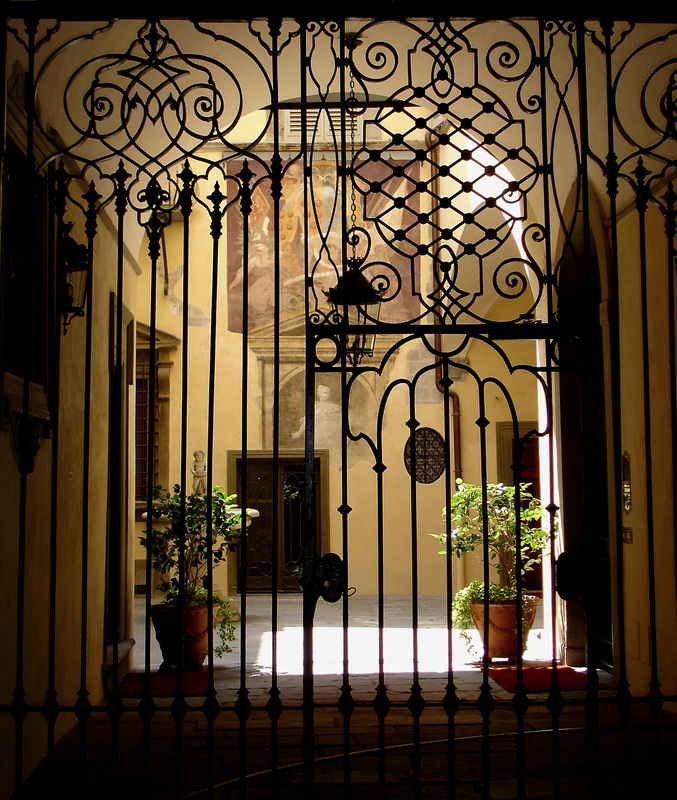 That is, until I was sitting in a conference room on an upper floor of the Hotel Brunelleschi a couple of years ago and, during an idle moment, glanced out the window. The framing apart, I was struck by the contrast between the magnificent cupola and the domestic clutter in the foreground, complete with TV aerials, aircon units… and washing. Most people assume this shot has been Photoshopped. 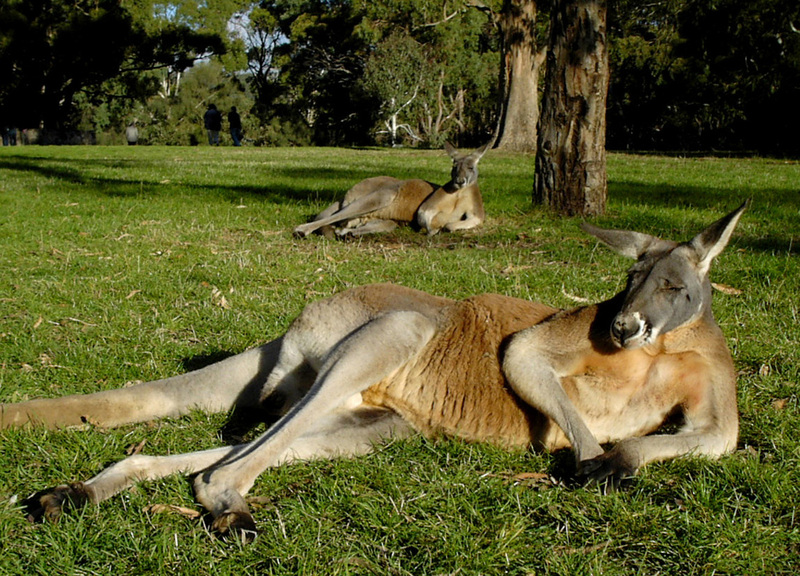 It hasn't - as anyone who has visited the Cleland Wildlife Park outside Adelaide can testify. The old roos lounge around beneath the gums, half-asleep and totally indifferent to any passing humans who may wish to photograph them. They don't even charge.. 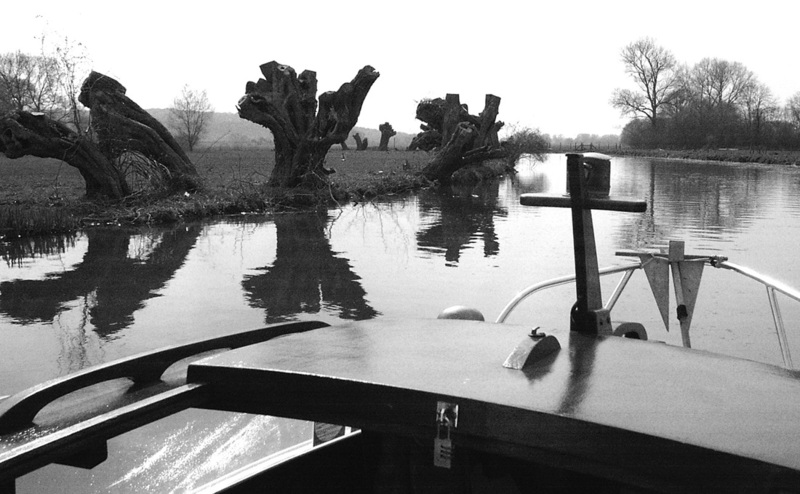 The River Thames near Oxford… The pollarded willows, dark and stark, line the bank like silent sentinels. Interestingly, the photo didn't really 'work' until it was converted to black and white. This was one of those happy accidents which occasionally present themselves. In the early 2000s I was staying in the Hotel Belgrade in the centre of Moscow. 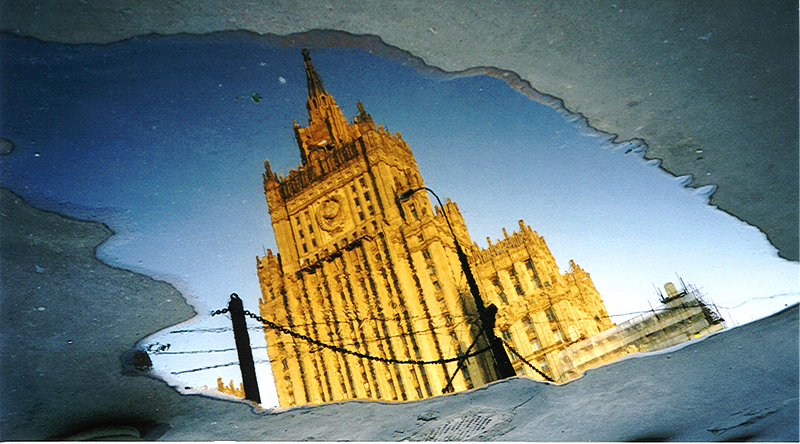 It had been raining overnight and, as I left for work, I noticed that the massive Stalinist Foreign Ministry opposite was perfectly reflected - and framed - in the puddle before me. Coincidentally, it was one of the last photos I ever took with a film camera. I haven't a clue what's going on here. It's the beach at Port Fairy, South Australia. 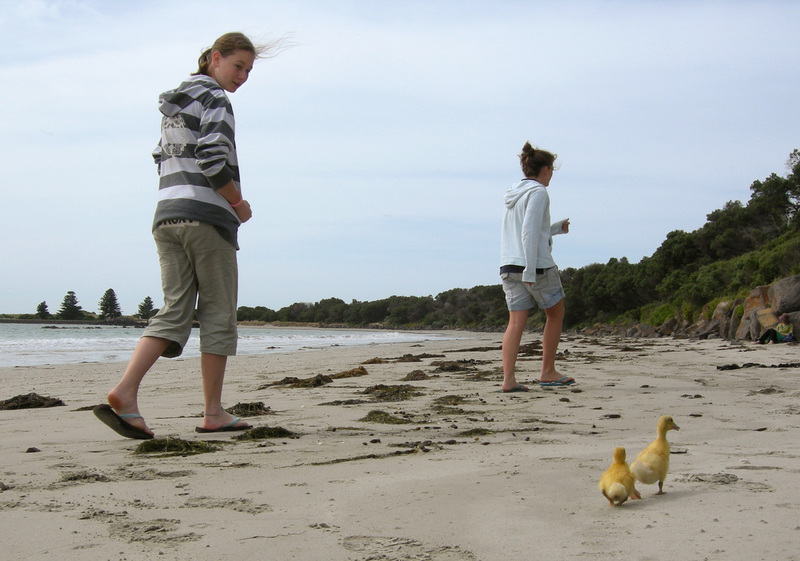 Either the girls were taking their pet ducklings for a walk… or the ducklings were wild and had decided on their own initiative to see more of the world. 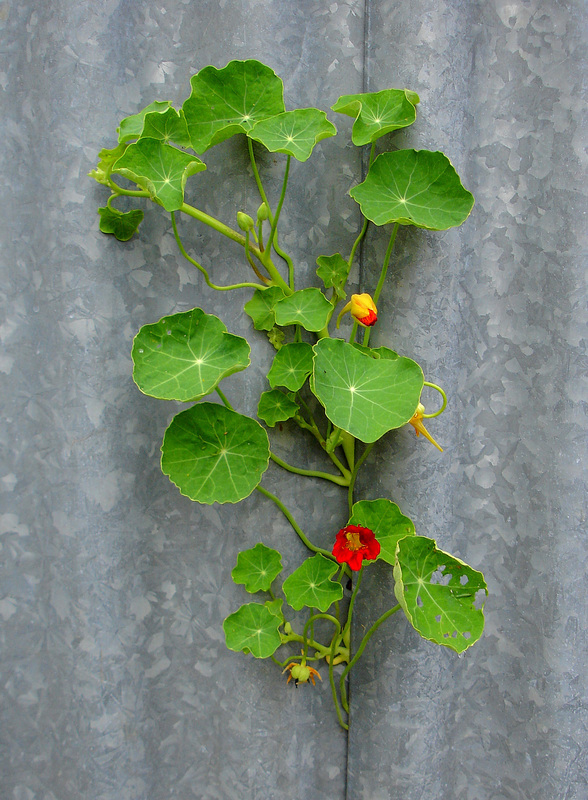 An example of how Nature herself is the supreme artist… A nasturtium makes a break for freedom through the seam of a corrugated iron fence in suburban Adelaide. What better foil for the vivid green and red than the iron's dull grey? 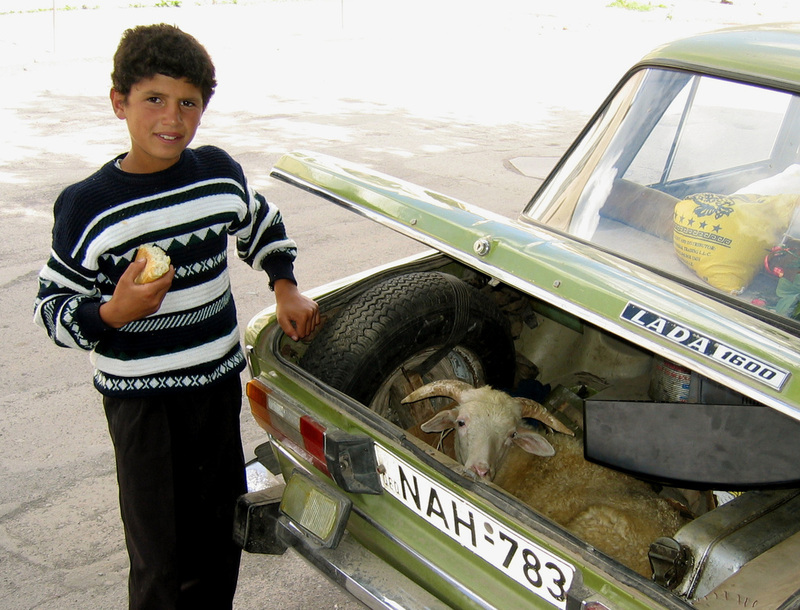 I suspect this sheep - in the Akalkalaki region of the former Soviet republic of Georgia - had good reason to look worried. The lump of bread the boy is holding tells more of the story than you, or the sheep, might wish to know. 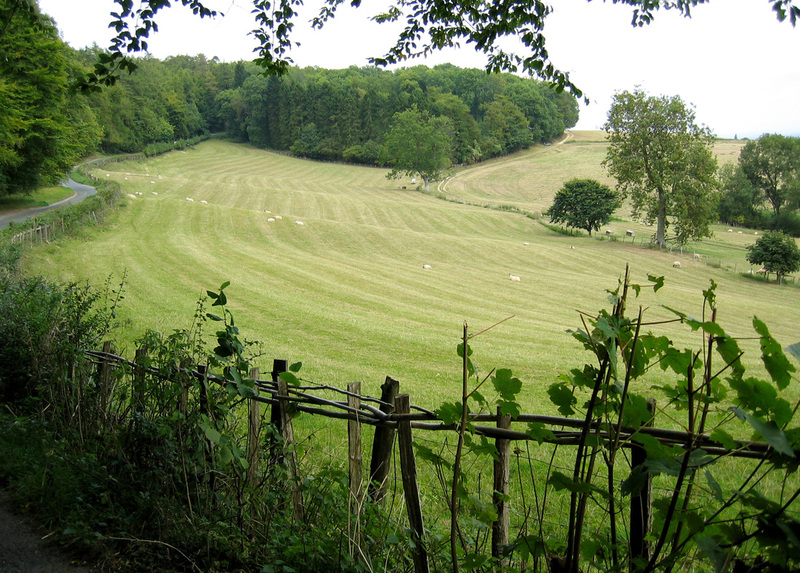 A field in Gloucestershire, UK. What struck me about this one was the way it swells like the sea. The sheep seem to bob among the grassy waves. 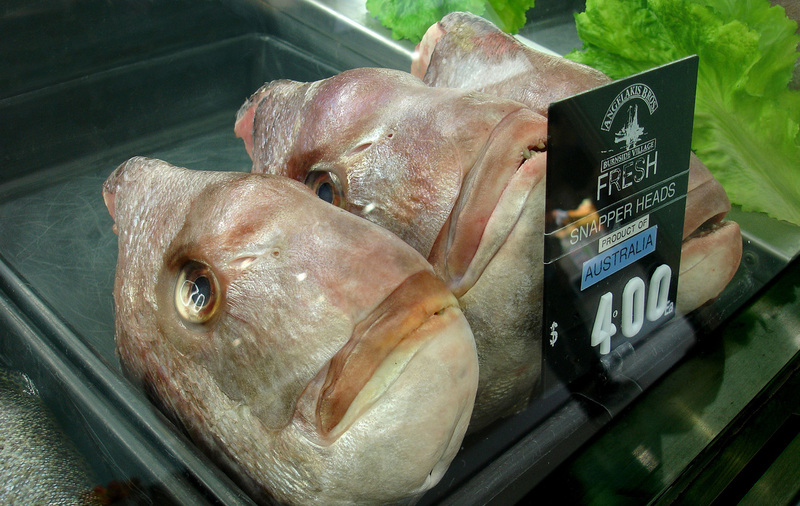 Sometimes the most unlikely places - here a fishmonger's in Adelaide's Burnside Village - offer the most startling images. Still don't think Darwin was right? Look again. 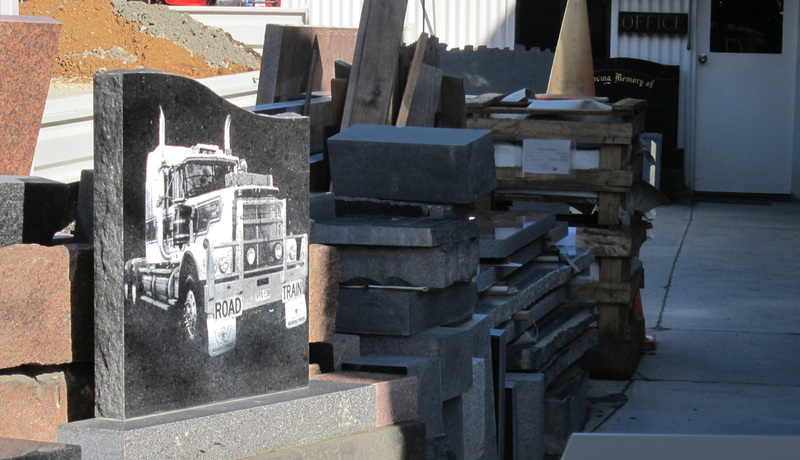 A monumental masonry yard in Adelaide… Your guess is as good as mine. Was the deceased a truck driver… or one of his victims? Namibia, driving along the Skeleton Coast. 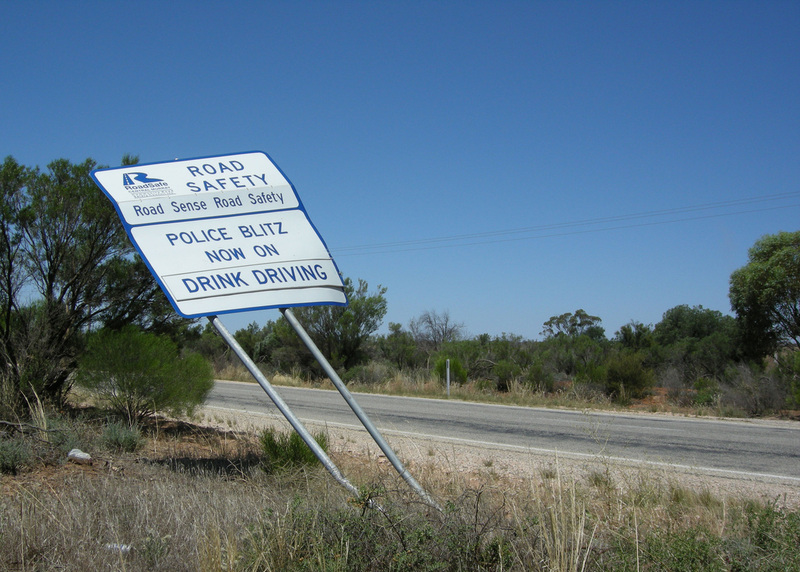 The sign may be 'blindingly' obvious, but presumably that's the point.